Il Best Western Gateway Adirondack Inn è situato nel centro di Utica. L'hotel è vicino alle principali attrazioni turistiche. Approfittate tutto l'anno del miglior prezzo garantito e di offerte esclusive. 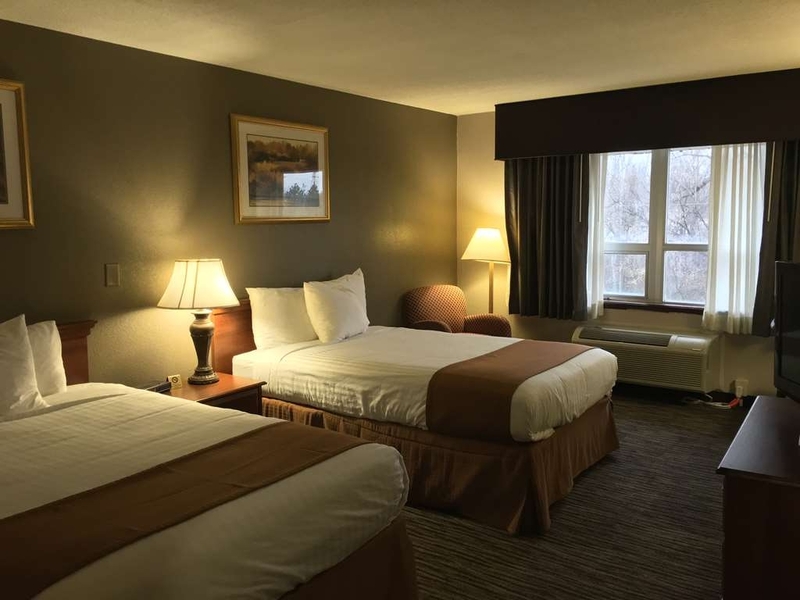 Benvenuto al Best Western® Gateway Adirondack Inn, nel cuore della Mohawk Valley! Proponiamo a tutti gli ospiti sistemazioni perfette in prossimità dell'uscita 31 dell'Interstate 90, a metà strada tra New York e le cascate del Niagara. Potrai esplorare la natura all'Adirondack State Park, sfidare la sorte al casinò Turning Stone®, partecipare alla gara podistica annuale Boilermaker 15K o visitare la National Baseball Hall of Fame and Museum di Cooperstown, tutto a solo breve distanza in auto dall'hotel. I viaggiatori d'affari apprezzano la vicinanza ad aziende e uffici della zona tra cui Griffiss Business & Technology Park e la sede del governo dello stato di New York. La nostra zona è sede di molte università, tra cui SUNY IT, Utica College, Mohawk Valley Community College, Hamilton College e Colgate University. E se da un lato ci sono tante cose da fare nei dintorni del nostro hotel ai piedi dei monti Adirondack, forniamo anche un comodo accesso a grandi città, come New York, Albany, Syracuse, Rochester e Buffalo. Il Best Western Gateway Adirondack Hotel offre un servizio cordiale, tariffe convenienti e confort che ti faranno sentire come a casa. Le nostre camere sono per non fumatori e dispongono di televisore a schermo piatto da 32 pollici con canali via cavo e accesso wireless a Internet ad alta velocità gratuito in tutto l'hotel. L'hotel offre anche confort di qualità superiore, come un centro fitness, una sala giochi, servizio di lavanderia a gettoni, parcheggio gratuito e un business center all'interno dell'hotel, con servizio fax e fotocopie gratuito. E non dimenticarti della colazione! Serviamo una colazione completa a buffet ogni mattina, dalle 6:00 alle 9:00 nei giorni feriali e dalle 7:00 alle 10:00 sabato e domenica. La nostra colazione include pancake, salsicce, frittatine, patate, yogurt, cereali caldi e freddi, vari tipi di pane, muffin fatti in casa, frutta fresca, oltre a caffè, tè, succo di frutta, per iniziare al meglio la giornata! Dai un'occhiata al nostro menu giornaliero. Se stai cercando a Utica, New York, un hotel comodamente raggiungibile, accogliente e a tariffe convenienti, siamo noi! Ti auguriamo un soggiorno gradevole! 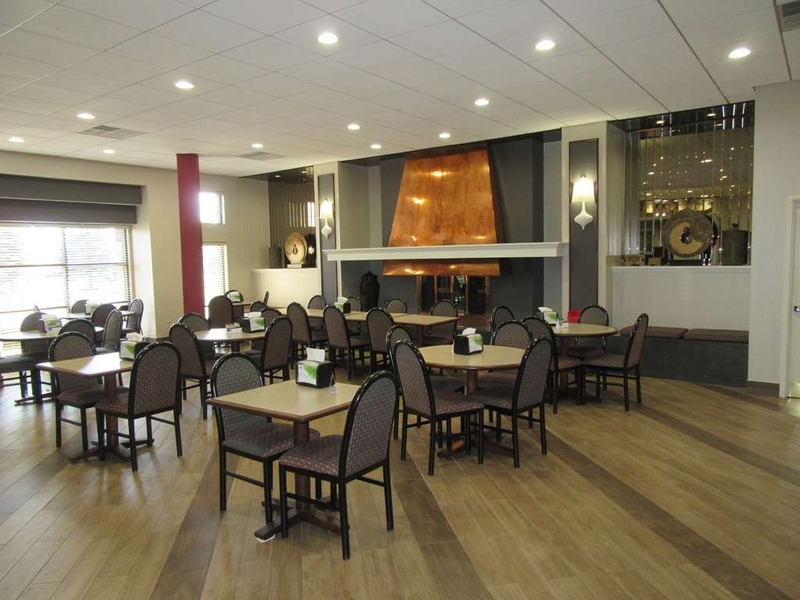 "Close to the thruway exit and near many restaurants." This hotel was easy to get to from the thruway exit and was near many restaurants - from fast-food to a steak house within walking distance. The room was nothing fancy, but the beds were comfortable and the room was clean. The sink was outside the very small bathroom. All of the staff were very friendly and helpful. The complimentary breakfast was outstanding. If you're used to modern, plush surroundings, don't stay here. If you just need an average place to spend a night while travelling, you won't be sorry. Our room rate was 144. I think it should have been closer to 100, but it was a busy fall weekend. Dear guest, thank you so much for staying at our hotel and made comments about our location, restaurant options , facility, friendliness about our staff, comfort of our beds. Also your comment about our out standing complimentary breakfast. We do have our Annex building which is interior corridor gives modern feel. Thanks for under standing about our rates due to busy weekend, in general our rates are always $25 to $60 lower than competitors providing similar service. Expect higher rate during May thru October weekends. We just did an I-90 trip from Montana to Maine and stayed in four Best Western's along the way. Of all four this one was most disappointing. The room appeared clean, however one of our beds smelled strongly of Ben-Gay, probably the duvet cover. The bathroom was short on towels, and there was only one set of toiletries. I haven't stayed anywhere else in the area so I can only compare this location with other Best Western's, but if it hadn't been almost midnight when we checked in we probably would have asked for a refund and gone a little farther down the road to look for someplace else. Our room was clean and comfortable. The beds would be nicer if they were queen, but doubles worked fine. My only suggestion is putting a “fart fan” in the bathroom. It gets pretty hot and steamy in there! :) The front desk was very friendly and efficient. "Pleasant stay in Utica, NY"
My stay at the Best Western hotel in Utica, NY was a pleasant way. Everything was nice. The staff was friendly with easy check-in and out. The appearance of the hotel was in good condition. The room was comfortable and quiet. The morning breakfast was delicious. Also this accommodation is pet friendly (with a fee). It is located off the NY state Thruway, exit for N. Genesee St., exit 31, south. Convenient for a jumping off point to do the Adirondacks in a scenic road trip. Dear Frank M, Thank you so much for staying at Best Western Utica and feedback and rating, NY. We glad to hear you have found everything perfect as all guest expect for hotel stay. We are the only pet friendly above economy hotel in our area. We hope to see you again. "In BAD NEED of a remodel"
Room smelled horrible, tv didn't work, rug was disgusting, pillows and bed are horrible.....Basically, there are 4 other hotels right near this one (2 I've stayed at before) that charge the same and are way way nicer!! Remodel is a must before I ever think of coming back. 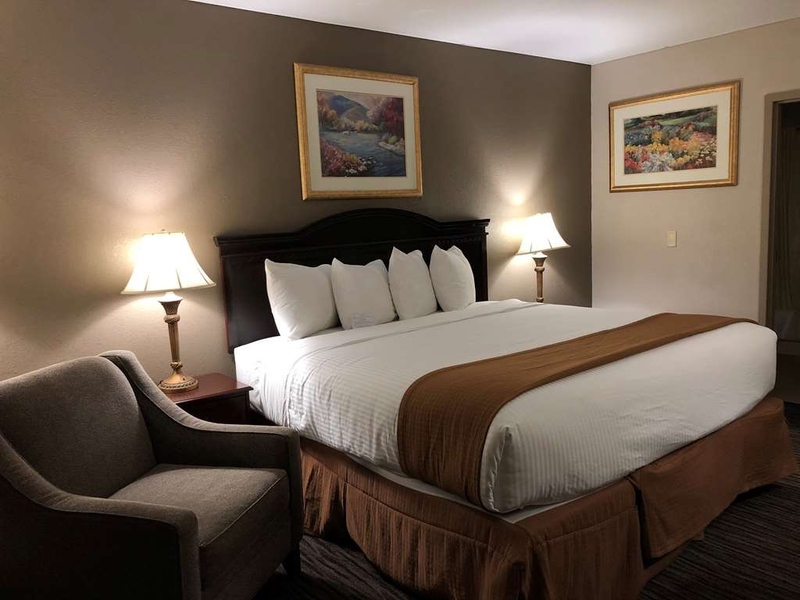 Thank you for taking the time to leave a review, All feedback is important to us, We apologize about any inconvenience you may had during your stay, Our rates changes based on supply and demand, our rates are about $40.00 to $80.00 lower than other hotels in the area. We stayed five nights in the main part of the hotel. The room was very clean and quiet, had everything we needed, with an extra large bathroom, which we appreciated. The breakfasts had lots of variety and plenty of food; it's not gourmet, but convenient. :) Parking was optimal. The staff was helpful and friendly. We would stay again! "Baseball HOF Weekend Stay July 26-30 2018"
Stayed 4 nights. Bathroom is very cramped in older section of hotel. 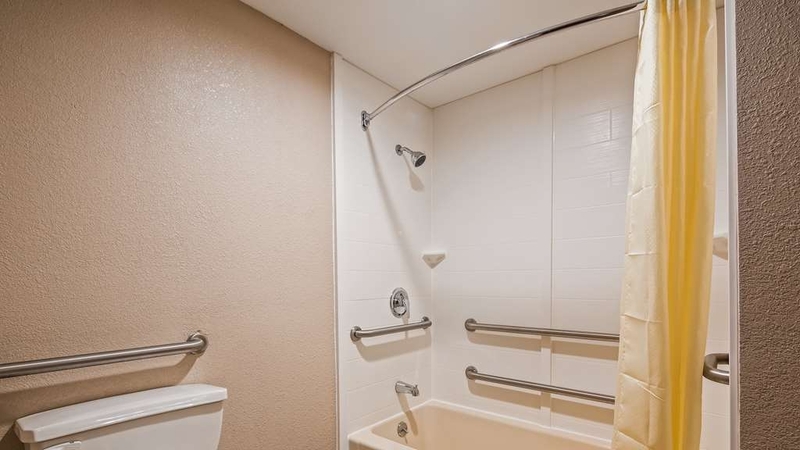 Toilet and bathtub/shower next to each other. Had ants in room A-330. They offered to spray chemicals I declined. Put down salt to curb ants from further invading bathroom. Breakfast buffet ok had to wait for food to be replenished on buffet line. I would select a better hotel in the future if I travel back in this area. Thank you for your feedback, We would like to apologize for any inconvenience you may have experience during your stay, We try our best to keep the breakfast full at all times and during our busy season seems to go quickly. "Great stay and Excellent staff"
We spent the the night here. This appears to be an older motel that has upgrades. There was a glass enclosed hallway in front of the door to our room. All the air conditioners vented the heat into the hallway. It was like walking into an oven when walking down this hallway, especially since the air temperature was in the low 90's. other than that we had a nice room with a comfortable bed. They have a washer and dryer available for guests and that was good cause we needed to do laundry. The morning breakfast was good, about the same as other free hotel meals. Waffle machine requires re-calibration. Undercooked . Oatmeal was made in a caldrun. Very gooey and overcooked. Of all the breakfasts I've had at these hotels, this one was downright bad.Right a review and was prompted not enough characters. REALLY!! I had nothing more to say. Thank you for writing a review, Sorry for your waffle not being cooked, We see that waffle machine is working proper, we have breakfast attendant on duty to help anyone if needed. My husband & I were traveling thru. We needed a room for the night as we were tired of driving. Most hotels in the area were full. This hotel had availability. The front desk was very helpful. Our room was clean. The hotel is very dated. We stayed in the portion of the hotel that is not attached to the main entrance. There was not an elevator (that I saw) for our 2nd floor room. The room was clean which was the most important part for us. Breakfast was served in the main hotel. You have to walk outside to go to the main building. This was not an issue for us because the weather was nice. I can see in the winter that may not be convenient. (There are rooms attached to the main hotel though). Breakfast was ok. It was your typical hotel breakfast. We had plenty of parking for our truck & 18ft cargo trailer. Semis were parked there as well. I would stay here for a quick night but probably not for an extended stay mostly due to the fact of going outside to get to the main hotel. "Good but could do better....."
Thank you for your review, Sorry to hear the other family had the ants, Our daily rate on most days are significant lower than other similar category hotels. We stayed here for one night on our way to Niagara. The staff were very friendly and helpful. The rooms are large and clean but very dated. Our AC was very noisy so we had to turn it off over night. We stayed during a very hot period so the outside corridors were unbearably hot (not the hotels fault). Breakfast was the normal BW style, plenty of food and a good choice. Plenty of places to eat near by but the best is the steak house across the parking lot! Thank you for leaving a great review regarding your recent stay at our property. Your business is very important to us and we value your feedback. By telling us what you liked about your stay and how we can improve, you are helping us deliver a superior experience for you and other guests in the future. We hope you will come back and see us! We were returning to NH after a long trip and needed a place to stay on the NY Thruway. We did not have a reservation so we picked up one of those travel magazines at a rest area. A phone call was placed to this Best Western and they were very helpful. We decided to stay there. As advertised, it is a recently renovated older motel and the renovation was a success. The lobby and dining area are very nice. The rooms clean and adequate. Restaurants are nearby. Breakfast was plentiful with numerous items. The only drawback was no refrigerator in the room. However, I would stay here again. Thank you for leaving a review, We appreciate your feedback. We're glad to hear you enjoyed your stay at our location, Hope to have again in the near future. The lobby was nice, as was the front desk attendant. We did not take part in the breakfast, but the room looked nice and was quite large. Our motel room had drywall dust around the edges, and lamps needed to be replaced. There was a faint smell I didn't like. "Easy to get to, inexpensive"
This is a very plain hotel. Everything was "adequate", but that's all. It is old, not bright but the bed was comfortable and the bathroom was fine. The heating/cooling was not comfortable. It worked, but it was not comfortable. It was a quick stay and worked for us. Nice clean stay, room was immaculate. iron in room was nice. I was not offered disability room access features if there are any. I couldn't get closed captions on the tv without the cable remote, which was not offered. Room clock was 30 minutes fast. So we were early for our events. Thank you for taking the time to write a review and giving us a good rating, We do apologize about not offering a room with disability access features and clock time being 30 minuets ahead , Usually rooms with any special needs are available upon request. 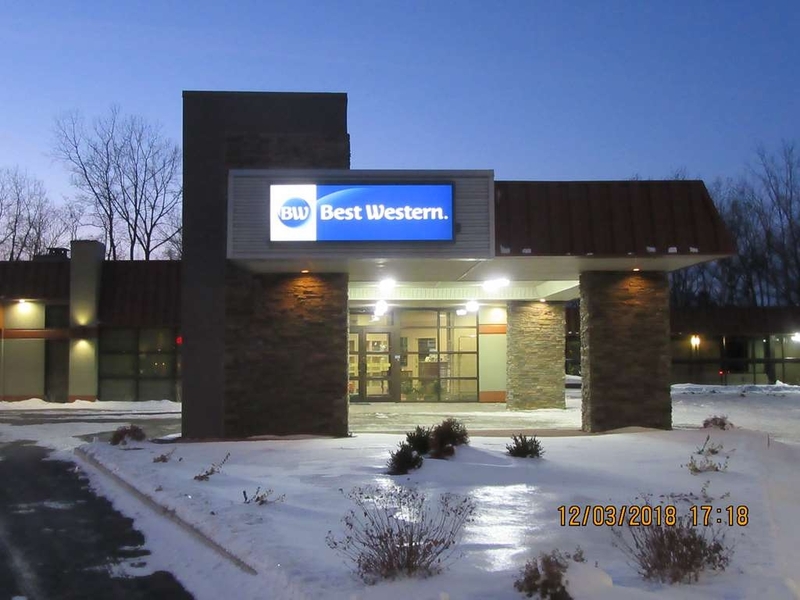 "A bit different & pet friendly"
This Best Western's design is principally single story with all rooms facing out into a glass enclosed corridor. Parking area is easily accessed with numerous entries. Very convenient. This trip was with our pet dog. The easy access was welcomed. Also there is a clean, well maintained open area in the rear for “exercising” your pet. It backs up on a wooded area so there is a bit of a natural experience there. “Mutt gloves” are furnished as is a receptacle. Well lighted. $25 pet fee. All else was fairly standard BW. Several exceptions. We used the rewards program. Rather than the usual 16,000 points for a night's stay this one required 24,000. Didn't appear to warrant the up charge. Also the new check-in clerk was uninformed about the program or any diamond elite status arrival amenities. Got the feeling the points were wasted here. Lastly, although the room was comfortable, the bathroom was not. Way too cramped. Sort of what you'd find on a plane or train. A slight exaggeration, but it makes the point. 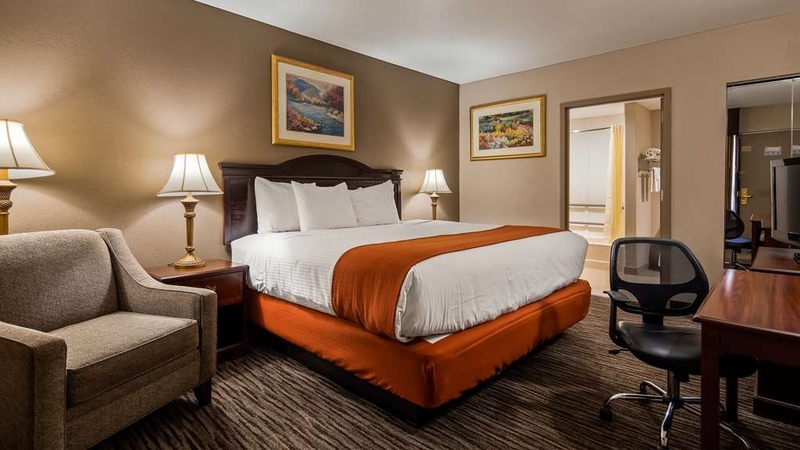 Bottom line: basic Best Western for value and comfort with up-tick for design convenience and a downstroke for using rewards points. Thank you for taking the time to write a review about your recent stay at our property. Your business is very important to us and we value your feedback. By telling us what you liked about your stay and how we can improve, you are helping us deliver a superior experience for you and other guests in the future. We hope you will come back and see us again soon. Thank you for taking the time to write a review, We are so glad to hear that you enjoyed your stay at our hotel and our staff was able to accommodate you, We hope to see you again soon! 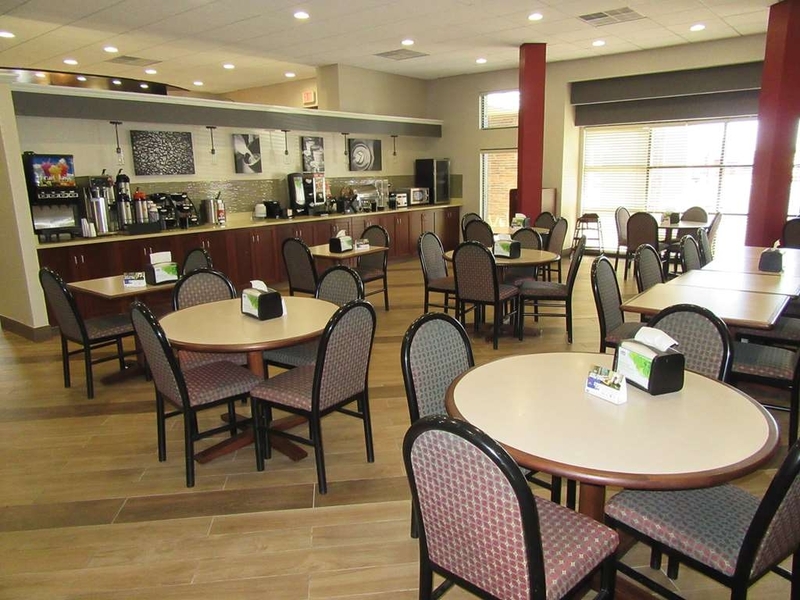 "Perfect place to stay for college visits"
Pet friendly and decent breakfast served. Back lot had lots of big trucks overnight but was still safe. It was just a bit more difficult to get to the grassy dogwalking area. All in all a very pleasant stay and free late checkout at 1! Much appreciated. Thank you for taking the time to write a review, We are glad to hear you enjoyed your stay and look forward to having you again. Thank you for taking the time to write a review, We are glad that you enjoyed your stay at our hotel, I'm glad our staff was able to accommodate. We look forward to seeing you again! Desk was very helpful. Helped with the television. Breakfast was very good. Location was very close to the church and funeral facilities. Got a good nights rest was very quite. We did not have any shopping, but there were many places to eat near the motel. The pet friendly option was important to us as we travel with our pet.. however the $20 dollar pet fee per night seemed excessive . We have stayed at other hotels where the pet fee was usually $20 for the entire stay. Therefore I would say the value including the pet option is poor. Thank you for your feedback, Our pet fee is now $25.00 per pet per night, most hotels has similar pet fee. "Comfortable bed and very quiet"
Found this hotel when we were traveling late at night and grew too tired to drive home after visiting family in Ohio. Had stayed at Best Western's before and always found them to be nice places and this one did not disappoint. Friendly staff, nice room, comfortable beds and very quiet. Thank you for taking the time to write a review, Happy to hear you enjoyed your stay at our location, and hope to see you in the near future. "Good price, and Quiet. Breakfast great"
Desk person very helpful. Breakfast very good and hostess very friendly. Older hotel but updated inside. The walkthrough glass with inside hallways kept out any noise. Would stay again if traveling through in future. Beds comfortable. Just slept and moved on to destination. Within 1 mile of I90. Service: great Rooms quiet Beds in our room great. This was a pleasant surprise. Despite being near the freeway it was very quiet. It's an older hotel with an odd configuration having 2 separate buildings, but that worked out OK. The staff was friendly and the breakfast was good. I'd recommend this hotel for travelers who don't need a pool. Check in was very fast, and the clerk was so nice. Room was very clean and comfortable, and quiet. Breakfast was very good and there is not too many better things I could say. Location is decent and easy to get to. Only downside was our room was in the annex building so we had to go outside to get to the main room for breakfast. But we would stay there again anytime. 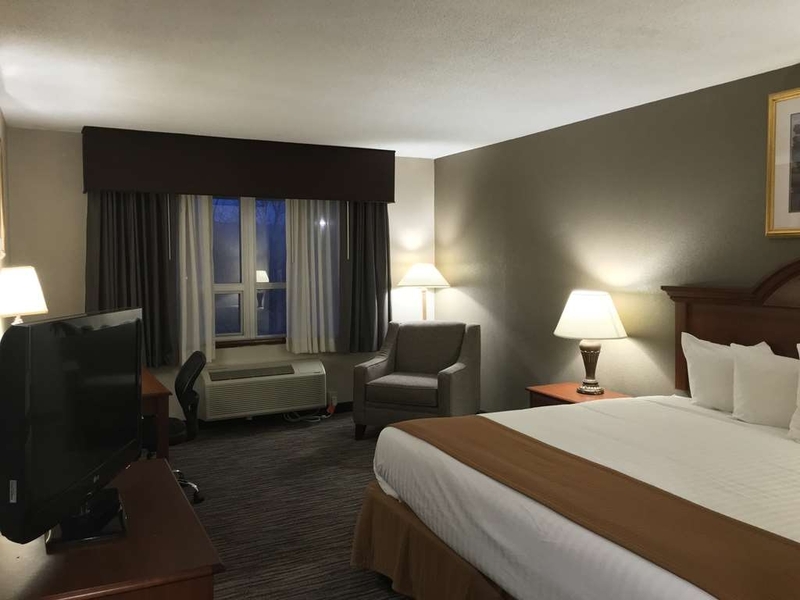 "Best Western Gateway Adirondack, Utica, NY"
We always stay at this hotel because of the service and friendly staff. It is positioned half way between home and our destination. The location is just off of the I-90 and close to the downtown area of Utica. This was a good hotel to stay at in Utica for its price. Not looking to spend a fortune on a nights sleep. The bed was comfortable, the place was quiet and the breakfast was excellent. Tony at front desk was friendly and helpful. Thank you so much for taking the time to write review, We are glad to hear that you enjoyed your stay at our hotel, and our staff was able to accommodate you. We hope to see you again soon. "Are there Different rooms for different people"
Have a dog? Checking was fine, double charge was corrected. Our room was left side and around back. There was a large parking lot with a nice grass area for dogs and wooded area behind that. (There are lots of feral cats at the edge of the woods) There is a breezeway to a row of individual rooms, Motel style. Entered the room and it was not like the pictures you see. Hair in the bed, chairs were visibly dirty, bedskirt yucky, no microwave no refrigerator so sad. I won't give more details but I was to tired to go elsewhere. :(.. I read over 12 other reviews below and looked at pictures. I really feel there are separate sections. There is the Best Western certified for franchises but then there is the dog ‘house' section of .. in the morning I skipped breakfast but wanted coffee, sadly it was empty. Awful nights sleep. Dear Guest, On behalf of our entire team, I would like to apologize for not exceeding your expectations. Your satisfaction is important to us and we will be using the feedback you gave us to implement improvements to ensure we offer a better experience for guests in the future. I hope that you will consider staying with us again so that we can have another chance to provide you with a superior experience. "Nicest pet-friendly rooms I've ever seen"
Friendly, helpful staff. Clean, functional rooms. In fact, the nicest pet-friendly room we have ever stayed in. Many choices for breakfast and plenty of tasty food. Great value for the price! I would definitely stay here again. Thank you for taking the time to write a review, We are so glad that we was able to accommodate you. We look forward to seeing you again! Best bang for your buck. Clean, updated, nice staff, good buffet. Definitely will stay at the Best Western in Utica, NY again. I stayed there with my son to visit SUNY. It's very close by to everything. Thank you for taking the time to write a review, So glad that our team at Best Western was able to accommodate you and your son. We look forward to having you at our hotel again. "Fall Trip to New England"
This was a great place to stay on our way back home. It seems that the room was recently updated. A nice bathroom area and king sized bed. That was very comfy. The breakfast was awesome. If you are looking for a value, stay here. Thank you for taking the time to write a review, We value your feedback and are glad to hear that you enjoyed your stay. We hope to see you again in the near future. My husband & I stayed at this Best Western after a long drive from Bar Harbor. When arriving in town; we got a bit turned around. We called the hotel and Tony talked us to the hotel. Tony was most personable and we checked in. Unfortunately, the first room that we went to smelled of smoke. We returned to the front desk and without hesitation, Tony gave us another room; complete with a full refrigerator and stove. The bed could have been more comfortable. The breakfast was fine. Usual eggs, sausage, waffles, etc. Dear Guest, Thank you so much for taking the time to write a review for our location. 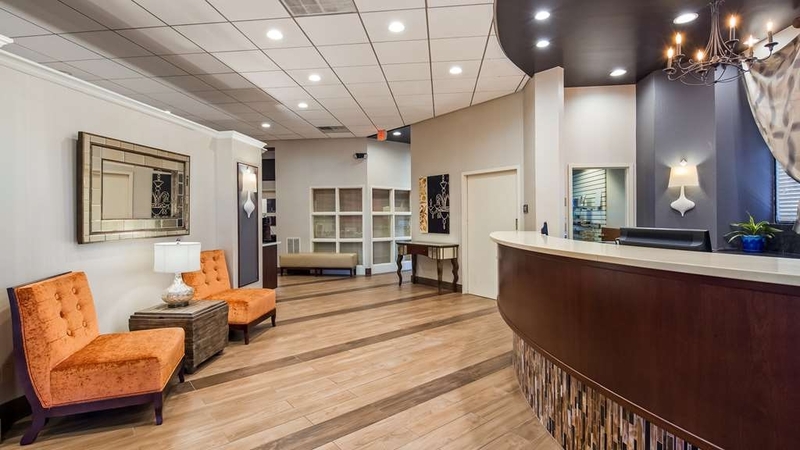 Tony will be so happy to hear that he was able to accommodate you on your visit, as he is such a great asset to our company, We deeply apologize about any inconvenience you nay have had when you first check in. We hope to see you again in the near future. "Best hotel I've ever stayed at." EVERYTHING at this hotel was absolutely impeccable, from the cleanliness of the room, to the updated decor, to the service and friendliness of the staff, to the selection and service during the breakfast buffet. Nothing was lacking, even the sheets smelled amazing!! I will never stay anywhere else! Dear Guest, Thank you so much for taking the time to write a review for our location, We appreciate your feedback. We are so happy to hear that you enjoyed your stay and our staff was able to accommodate you. 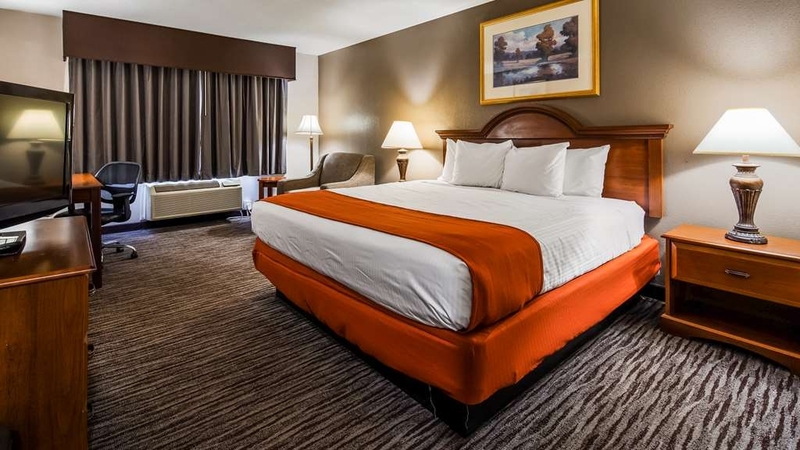 At Best Western our goal is to make everyone feel "Home away from Home". We look forward to having you again. Rooms were dirty. There were rings around the tub, cobwebs on windows, crumbs on table, dust everywhere and stained towels. We changed rooms and the new room was worse than the first. The staff tried to help but we couldn't get passed how dirty the rooms were. Thank you for taking the time to write a review, We appreciate your feedback and are happy to hear you enjoyed your stay, and Amanda was able to accommodate you. Sorry about the cobwebs you found during your stay and will be going over this with our housekeeping staff. We look forward to seeing you again. This hotel was very nice, clean. We have no complaints and would stay again. Location was good for our trip as we needed to be hear Herkimer, NY and go to the historic areas finding family data. Nice area and good room. Thank you for taking the time to write a review. We are so glad to hear you enjoyed your stay with us. We look forward to having you again if you ever come back to the area. Thank you so much for taking the time to leave a review, We are glad to hear that our staff was able accommodate you during your stay, We usually do have a lot of rooms on ground level depending on availability or upon request. We hope to see you again in the near future. Reception was very nice. Big rooms all on one floor. Room are all outside entrance, easy to get to. Large rooms, lots of amenities. Very clean. Bed comfortable. Lots of tv channels. Breakfast was good with lots of choices and fresh fruit. Nice people. Thank you for taking the time to write a review. Glad that our reception staff was able to accommodate you, and you got to enjoy some of the other amenities at our hotel. We look forward to having you again if your ever in the Utica area. Very clean, comfortable, great location Very good breakfast. Safe location. We were doing a New England trip and this was not a planned stop, so reviews and price does help with a decision when you are extremely tired and don't know the area! "Great Hotel in Upstate NY"
We were very please with accommodations - room was clean & bed was comfortable. Very good breakfast was provided with our favorite (hot oatmeal). It was cooked just right! Breakfast attendant was friendly and efficient - kept everything well stocked throughout breakfast. We would choose this hotel again when in the area. Thank you for choosing to stay at Best Western and also taking the time to write a review! We are so glad that we was able to accommodate you. Breakfast is the most important meal of the day glad to hear you enjoyed it!! Nothing special about this hotel. Very nice staff who are attentive and helpful. Mattress was beat in the room - should have been replaced long ago. Overall quality was just OK. Breakfast items could be better. Thank you for leaving a review, We are sorry to hear that your recent stay was not up to your expectations. 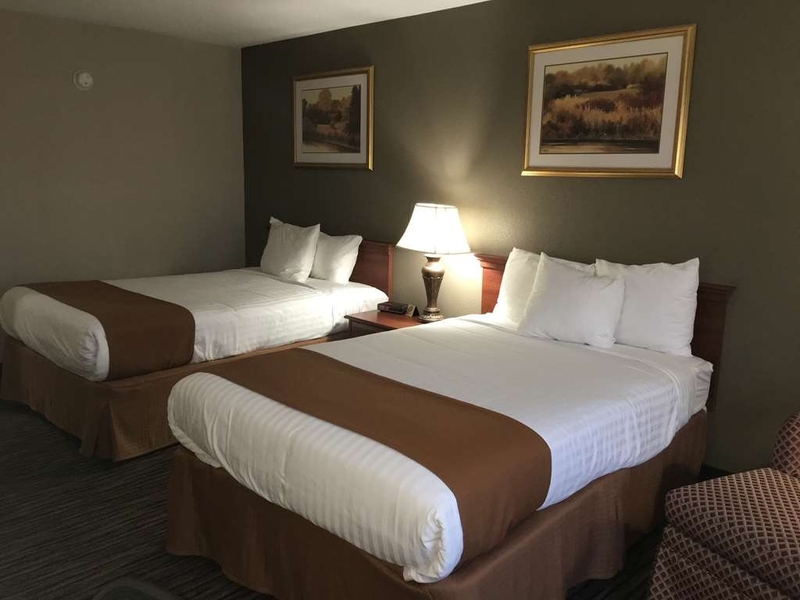 We are glad to hear that our staff was able to meet your accommodations and as for our mattresses we usually get a lot of positive feed back from our other guest but we will definitely take your comments into consideration on our next renovations. We hope to see you again. My sister and I traveled to Canada and we stayed here coming and going to Canada. Our one Night stay was comfortable. Staff was pleasant and food excellent. 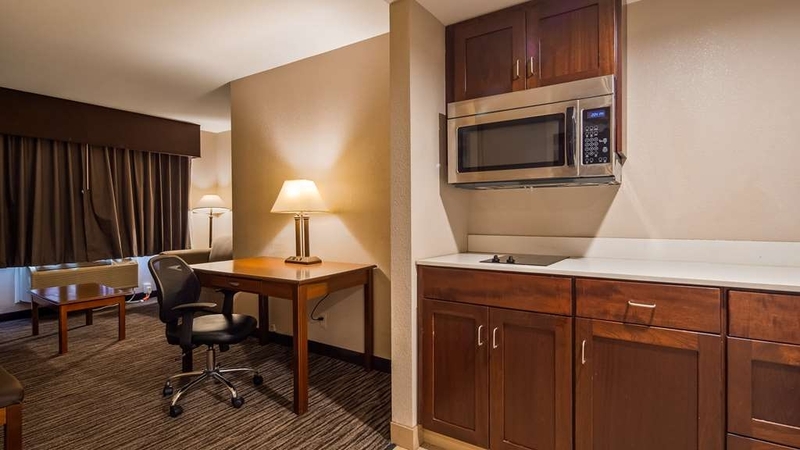 Love the frig and microwave in the room. Bathroom a little small to move around in. Thank you for leaving a review, We appreciate your feedback, glad to hear you enjoyed your stay! Hope to see you again soon!! Thank you for taking the time to write a review, We are so pleased to hear that our staff was able to accommodate you. We hope to see you again soon ! A young man named Ron was extremely kind and helpful. We were in town for a wedding and were on a tight schedule. We arrived at the hotel around 2:15. Being early and knowing that we needed to change and leave for the wedding by 2:45, Ron personally made sure our room was ready for us, if only just for changing. He said if housecleaning wasn't done, we could still go in and change and then house cleaning would continue after we left. He went to it and checked it out making sure we were all set. The next morning after a delicious breakfast, Ron again helped us out. We wanted to visit the cemetery in Clinton where my family is and I couldn't locate it on my GPS. Ron looked it up and helped me find it on my GPS so we could get there. I also told him we were going to clean up around the markers and he provided me with some trash bags to help take away the excess overgrown grass. He went above and beyond my expectations of service. I would definitely stay there again. It was a short but enjoyable weekend. The room was very clean and the bed comfortable breakfast was delicious! Thank you so much for taking the time to write a review! I'm so pleased to hear that Ron was able to accommodate you, We strive to make our guest feel "Home away from Home". Happy to hear you enjoyed your stay and got to eat a great breakfast. We cant wait to see you again! "A bit pricey for what you get but close to Hwy"
We used this hotel on our way to Rhode Island. Conveniently situated close to highway. Very average hotel though, and a bit pricey for what you get. Fast Food restaurants nearby. Would try another hotel next time. Thank you for staying at Best Western Utica NY, Rate changes during summer seasons for all hotels in our area, and our rates are much lower than similar hotels in Utica NY. "An Enjoyable Place To Stay"
This is a nice hotel that is clean, comfortable, with pleasant, efficient people at the front desk. It's just off the NYS Thruway, but is very quiet at night. It's an easy walk to fast food places & family eateries. Down the street is a excellent steak house, also within walking distance. I've stayed here many times over the years & always come back. The rates are reasonable. Thank you for taking the time to write a review, We value your feedback. Our staff strives to make our guest feel "Home away from Home". Cant wait to have you again! Arrival was pleasant. Group of workers, staying at hotel, were sitting outside entrance w/30 pack of beer & smoking cigarettes. Some w/o shirts on. Very unappealing, especially to my wife. Room was clean. Bathroom was remodeled, bright, and clean. There was a variety of breakfast items but cooked items were cold and breakfast potatoes hard. Realize it is a budget hotel but still disappointed in breakfast. "Decent hotel for the price, good breakfast"
I stayed at this hotel while doing a book-signing in Utica. I must admit, the hotel was nice, with pretty rooms and a good complimentary breakfast in the morning. However, when I arrived, the front desk person tried to get me to pay $180.00+ for a room, just because there was a motocross convention in town that night. Really? I don't think any Best Western is worth $180/night any time. To his credit, he did come down to $120/night when he saw I was leaving to drive out of town for a lesser price. Anyway, the room was attractive and quiet, and I got a good night's sleep there. I would return for the lower price. We were heading west on the NY Turnpike looking for a place to stay. It was getting late and there did not appear to be many hotels to choose from. This hotel was OK. It had a clean room and there was a good pizza restaurant not tooo far away. The hotel looks somewhat dated. We did not have any problems with staying there. My wife and I were heading East to visit relatives in New Hampshire and Massachusetts. It was a driving trip which is not my favorite to do trips. Anyway, after 11 hrs of driving, I stopped at Best Western because I had a coupon for a discount. However, the hotel did not accept it because the coupon was only good on Friday & Saturday nights. This was a little backwards in my estimation as I would have thought that Thursday nights would be cheaper (non weekend). Wrong. Anyway, we stayed here because I was tired and sick of driving. The front desk clerk (Tony) was very nice. He gave me a military discount. He also gave us a very nice room,.The bed was very comfortable. The amenities were okay but not great. There was no refrigerator or microwave in the room. There was a work desk with wifi which was nice.The bathroom needs updating but was sufficient to shower etc. The rooms were originally outside entry but BW added a nice exterior enclosed hallway for safety purposes. I recommend this hotel with some drawbacks. BTW, always stop at each state's Info Center and pick up the free discount coupon booklets. One can generally save a good amount of dollars by doing so. Thank you so much for taking the time to write a review. We are glad to hear that you enjoyed your stay at our hotel. We try our best to make our guest feel "Home away from Home" and hope that if your ever in the area again, you'll come visit us again! Great location after our Hall of fame tour in Cooperstown. Right near hwy 90 for our next day's trip to Michigan after a yummy breakfast. We enjoyed having a connecting rooms with auntie. Her room had a frig for our cooler items. Thank you for taking the time to write a review, We are so happy to hear that you enjoyed your stay. We hope to see you again in the near future! 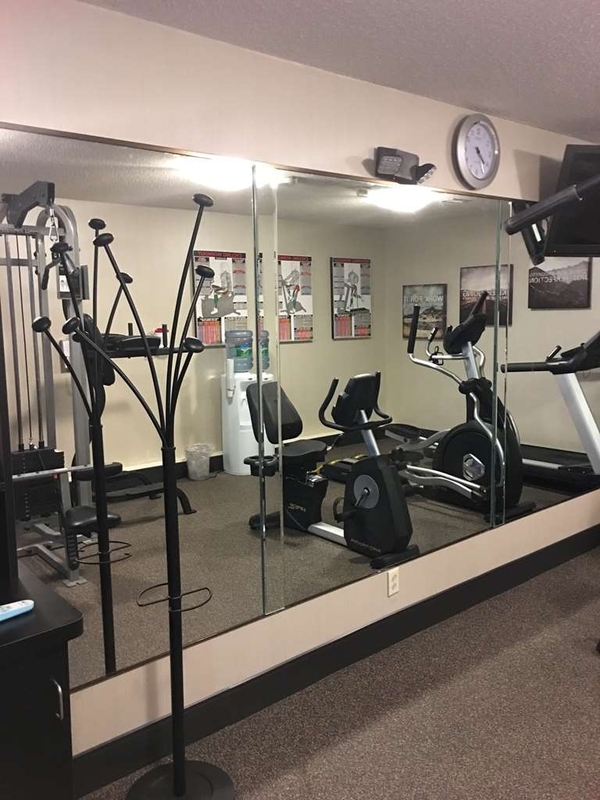 Was in the area for a wedding and stayed at the Best Western because they had a fitness room. The location was great, about a 10 minute walk from the Utica bus station, which was nice. The room was good size, and the bed was amazing. There's even a Denny's across the street which was a huge plus! Easy check in and easy check out. Thank you for taking the time to write a review and Thank you for choosing our location, We are glad to hear that you enjoyed your visit and hope to see you again if your in our area. "Renovated, Great for Pets, Clean, Convenient"
Firstly the staff here couldn't be better. Tony-you were so nice on the phone and in person. We have well-travelled pets and this place was perfect. Hotel retained its character and has been renovated. Drive in access is great. Good people, good location, nicely kept. Thank you for taking the time to write a review, We appreciate your feedback and so glad to hear that we can accommodate you on your stay at our hotel. We are also glad to hear that Tony and the rest of our staff could accommodate you on your stay. Cant wait to see you again ! This hotel was filthy, old, broken down and overall awful. My husband and I woke up with bug bites! The wall had filth on it. The toilet seat had cigarette burns. The door didn't even seem to completely latch/seal. The ONLY reason we stayed was due to our late arrival with no other options or we would have LEFT! A nice quiet room, with a comfortable bed, and a very helpful staff. I suggest improving the breakfast assortment (bananas, plain yogurt, herbal teas) and adding a fridge and a microwave. Overall, a pleasant stay. looks like an old hotel/motel rooms are clean and up to date. wifi works like a champ. staff is great and the best restaurant in town is right in front of the hotel. Delmonico's Italian Steak House has reasonable rates and the staff here is exceptional. you will not walk away from here hungry. the breakfast at the hotel is acceptable. make your own waffles of enjoy the pre cooked egg omelets. Had asked for an assessable room and told there were not any. Fortunately the bathroom was small enough that I could support my weight on a couple of items and raise up off the toilet. Had a very quiet restful nights sleep. Breakfast was mediocre, staff was very friendly and checkout was fast. Thank you for taking the time to write a review, We apologize that the room type you requested was unavailable at the time. We are happy to hear that our staff was able to provide excellent customer service. Always a plus to get a good nights rest. We hope to see you again! On our way to Cooperstown we spent the Friday night in Utica. This BW is located off a main thoroughfare behind Wendy's and McDonalds. We checked in around 4 by the welcoming staff. The room was decent, maybe a bit outdated. The beds were comfy, but the walls were thin as loud partiers reentering the hotel woke us up at 1 and 3. Not the fault of the hotel, just annoying that people can be inconsiderate. Breakfast was good with sausages and omelette. Thank you for taking the time to write a review. We appreciate your feed back and glad to hear you enjoyed your stay. Our staff here strives to provide excellent customer service, and we hope to see you again. "Fine looking location and a great place to stay!" Stayed at this hotel for 2 days while on vacation. The room was clean and the premises well-kept! Had some issues with the check-in for the additional reserved day; however, the place is good! Breakfast is complimentary and plentiful. Hotel is right next to the Erie Canal and the Mohawk River. Great access to downtown Utica, and all the attractions in the local area. Rates are reasonable, and look for coupons in the travel magazines to save some additional dollars! "Decent Night's Stay and Value"
Like a number of hotels on the Utica "strip" (Genesee st), this hotel is an older hotel that has been re-habbed, and truthfully, there was nothing significant wrong with our stay. The room was clean, though with a somewhat stale smell, the king bed very comfortable, and the facilities in generally good repair. 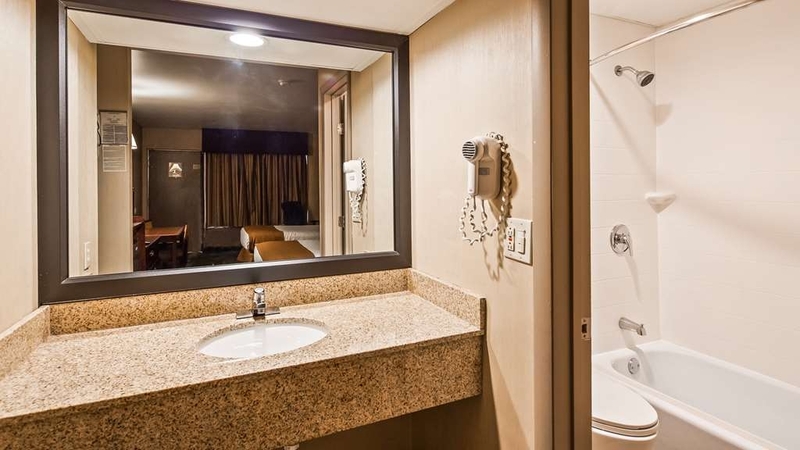 Two minor annoyances, the hair-dryer buzzed and sparked when we plugged it in and the tub did not drain adequately (Rm212) as we showered (it always amazes me why hotels don't have tub drains on a "maintenance" schedule to remove the hair, etc. that frequently causes this). The breakfast was very good, with considerable variety and prompt attention to anything running low, and the front-desk courteous. As a 40-year business traveler, the only other thing I'll mention is that hotels underestimate the degree to which travelers notice their attempts to save money by "saving" on things like ample tissues, toiletries, and the quality of toilet paper - we know in aggregate these costs add-up and appreciate you're trying to keep rates low but we'd gladly pay a few dollars more to find the amenities we expect, both in quantity and quality. With a college student starting at the local university, we expect to make many trips to Utica in the coming years, and I would stay here again and recommend it to others. "One of the lower level Best Westerns but ok"
I keep forgetting Best Western has different levels..this one I gather is close to the bottom. I had a very strange room. It appeared the building was a motel with rooms opening to the outside at some point, then sometime after they added a glassed in hallway. The result was that the only window I had was to the hall. Needless to say, the window curtain stayed closed. I actually liked not having people above or below me, or lots of hall traffic. That said, its an acceptable property. Desk staff are very nice. Breakfast was good. The breakfast person did not even acknowledge my thanks. You can walk to a Dennys and an assortment of fast food places. 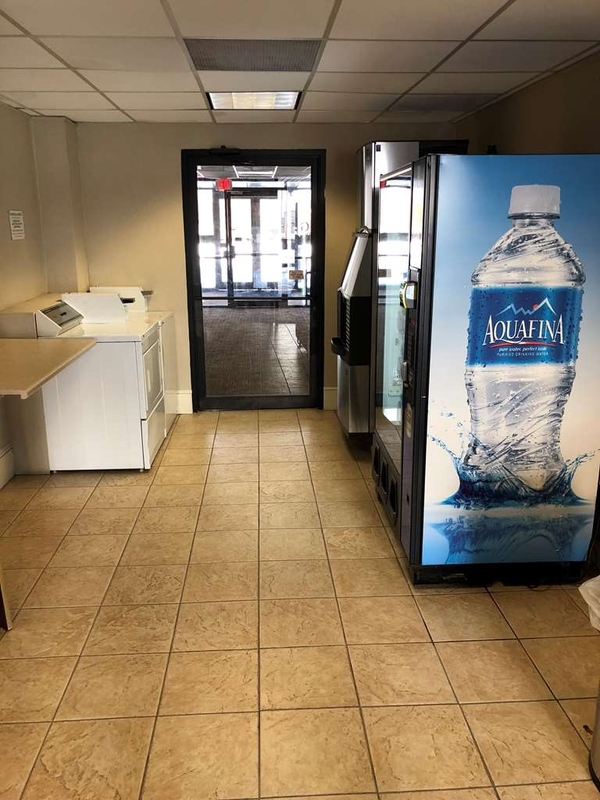 There is a washer and dryer and some vending machines. My room did not have a frig or microwave. Bedding was good, and plenty of hot water. Really well located for folks passing through- right next to thruway without the thruway noise. Stayed at the Best Western Saturday, July 8 2017. The rates more than double for this day only - due to the Boilermaker the next day. (I thought there were laws against this type of practice). The room was clean and comfortable, although I was expecting a small refrigerator and microwave (there were neither. Breakfast is ok - nothing very special. "Beat Western immaculate and perfect"
Excellent hotel...clean, neat, great amenities, breakfast, etc. Love staying here and will do so again. Easy to find, near places to eat and places to visit. I had. Choice of what floor to stay on ,too...usually hotels just tell you! This was a real help to me. Dear Bonnie K, thank you so much for your review and comments for our location, cleanliness and breakfast. Looking forward to see you again. "Good hotel good staff just getting a little bit dating"
Dear Guest, Thanks you so much for staying at our hotel and comment about friendliness and helpfulness of our staff and cleanliness of our hotel. For your information we have completed renovation of our entire hotel recently and keep updating as needed. "Beware of Bed Bugs!!!! " We found a bed bug on the mattress about 20 minutes after checking in. We immediately picked up our stuff and left. The staff was very apologetic and seemed as troubled as we were. We were given a full refund immediately but beware there's no way to know if this is isolated to one room. Needed a place to overnight on the way home from a road trip. This Best Western was just what we needed. Good location off the highway, clean rooms with fridge and microwave and good price. The staff was very friendly. I have stayed at this motel on 2 occasion's & have been very satisfied both times. Pleasant & helpful staff, great breakfast & comfortable beds. 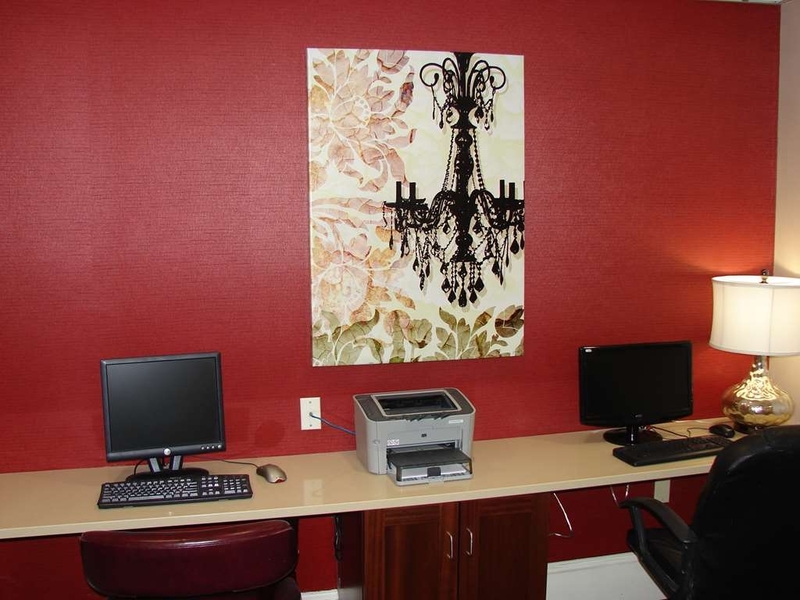 The price is very reasonable & the motel is located close to restaurants that you can walk to. Traveled to Utica for family funeral. Have always stayed at Best Western motels because I have never had a bad experience with any BW facility I've stayed at. Staff was great; room was very nice; the breakfast bar was very good. I would recommend this motel to anyone traveling to Utica, NY and will stay there next time we visit Utica. The rooms need to have key card readers that work. Don't expect to have the linens you need. Our room was in disarray when we entered. Tony at the front desk was friendly and tried hard to make the problems go away. "Comfortable night had by all"
Thank you for taking the time to write a review. We are happy to hear that you enjoyed your stay with us. Yes our Best Western reward program does have many perks and glad to hear you find it wonderful. Hope to see you again in the near future. "great hotel to visit Acadia"
Great location in Bar Harbor ME a short drive to Acadia National Park. My husband and spent 3 nights and were pleased with location and amenities. The staff was very helpful and even sold us $2 charcoal to cook up some chicken for dinner and lunches to carry on our hikes. Best breakfast setup I've seen at a hotel. Grill and washer/dryer out back of hotel were very convenient. Thank you for taking the time to write a review. We are happy to hear you enjoyed your stay with us. Also glad that our staff was able to provide excellent customer service. We hope to see you again in the near future. I always stay at this hotel whenever I visit Utica. Many good restaurants are at walking distance. Entire staff is amazing. Love breakfast attendant Donna. Excellent breakfast. Love fresh baked muffins. "Description of hotel and services." Room was clean and people were very helpful. Manager was helpful in advising us on the local Italian restaurant, which turned out to be true, very good. Breakfast had plenty of different types of food and drinks, such as eggs, sausage, pan cakes, toast. All of which were very good. Bed bugs were found in our room after doing the immediate mattress check when entering a hotel. The employees and manager were dismissive and rude. Encountering bed bugs is a situation no one should deal with. The management and employees need training in dealing with such situations. Do not stay here. Dear Guest, Thank you for your feed back, I apologize for experience you had during stay, any guest bed bug complain we receive, we and our pest control agency thoroughly investigate room and treated if needed. We also doing bed bug check for all rooms part of our monthly preventive maintenance . Our front desk staffs are always courteous and handling all situation politely. 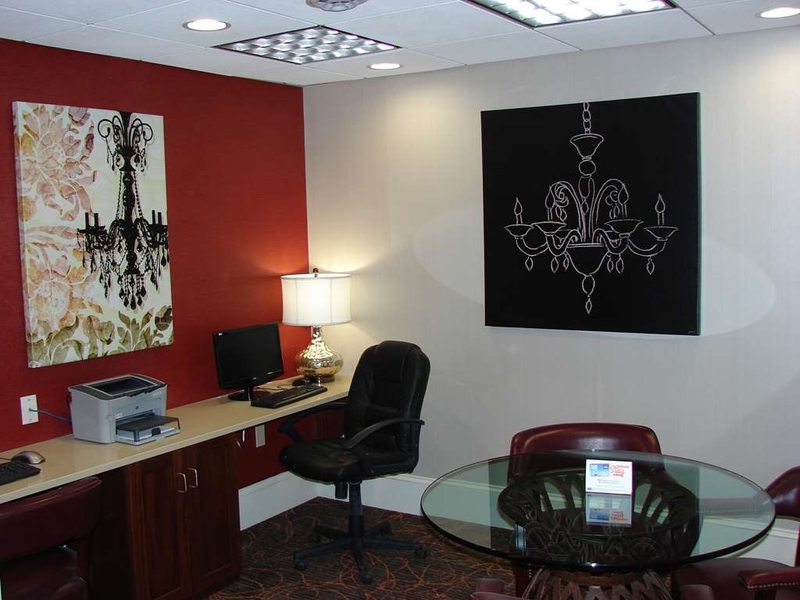 I was very pleasantly surprised at how enjoyable my stay was here at the Best Western. In town for a college graduation and got a great night's sleep and treated very well by the staff. Breakfast was better than I expected too. I would definitely recommend this hotel. Staff we encountered were extremely helpful and very pleasant. location was very good not far off the highway close to all amenities. Room was very clean , with comfortable beds. Breakfast had a very good variety. Thank you for taking the time to write a review. We are extremely happy that you enjoyed your stay with us, Our goal is to make everyone feel like their "Home away from home" Also happy that you enjoyed breakfast. Cant wait to see you again in the near future. "A quick stop over on the way home." Clearly a workingman's motel, judging by the trucks and transports in the parking lot, and the good folks at the free breakfast early in the morning. The front desk staff could not have been friendlier or more accommodating of our last minute request for a roll out bed for an extra traveler or for extra towels and the like. The room was clean, the linens fresh, the bed comfortable, the breakfast fine, and the price right. There is not much more that I want from a quick overnight where all I am looking for is a place to sleep. Friendly and nice environment. Rooms are decent. Nice lobby. Good breakfast. Overall, clean room. Helpful staff. Affordable . Was in the are to attend my son's graduation from SUNY Polytechnic Institute. Thank you for taking the time to write a review. Happy to hear that you enjoyed your stay with us. Hope to see you again in the near future. Thank you for taking the time to write a review, Sorry about your room not being service during your stay, We will be going over this with our housekeeping staff. We take pride in making our guest feel home "away from home" and sorry that you had these issues during your stay. Hopefully in the future we can improve your visit with us. Thank you for taking the time to write such a detailed review. All your comments are essential to educating our staff about good and bad service. I wanna apologize on behalf our team at the Best Western for not meeting your expectations and hoping you can give us another chance in the near future. "Good for a night. Overpriced." Professional staff. Knowledgeable and friendly. From the front desk to housekeeping. With that said, compared to other Best Westerns, I would rate this establishment as a Motel. After I left the lobby. I got the impression it was old and worn out. Despite being told the hotel / Motel has been recently renovated. Thin walls. You can hear your neighbors conversations, pets, and kids very well. Even with the TV on. Rooms are clean. Bed is comfortable. With paper thin pillows. Tub shower combo with plenty of hot water. TV typical for hotel/Motels these days. One available plug in entire room. 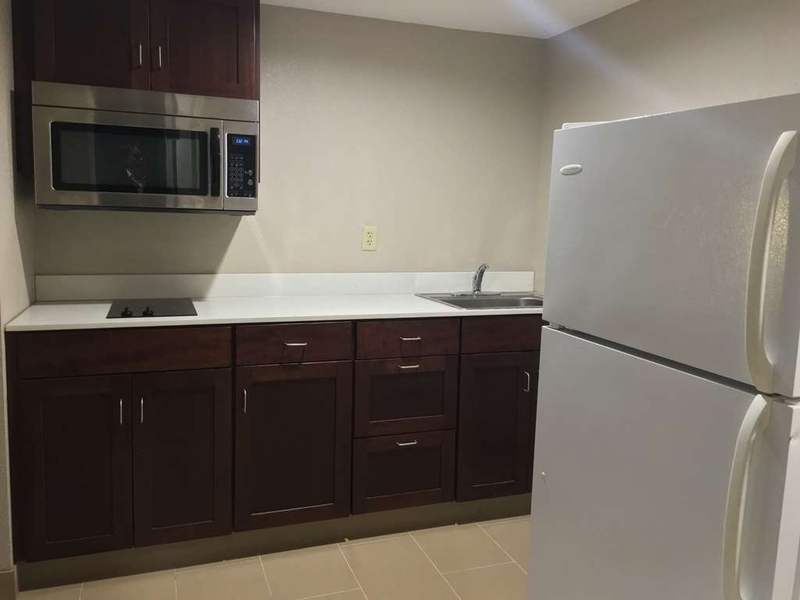 Fridge and Microwave in some rooms. Not all rooms. Some rooms ( of same type ) have comfortable chairs, not all. Ironing board and iron. Single cup coffee maker. At 100$ and more, usually more. One would expect much better standards. Especially from a Best Western. This establishment is more equallivant to a Super 8. At best. Thank you for taking the time to write a review, We take pride in our guest services and happy that our staff was able to accommodate you. Sorry about any noise inconvenience that you may have experience during your stay, Also just to inform you that guests have two options depending on availability to stay in the main building or with interior corridor building. Hopefully you can give us another chance in the future and have the option to request interior corridor building. I guess there can be great variation between different Best Western rooms.... I booked a studio for my family (and dog) and then when we got there we were down graded to a king room that was pet friendly. This hotel has a nice section (I assume from some of the excellent reviews) but it also has a crappy section. The pet friendly room is essentially a motel room without insulation (to cut down noise) and a door that was questionable when closed, almost no electrical outlets, some kind of black fuzz balls on the white sheets, curly hairs in the ice bucket, and a shower drain that gurgled loudly when the neighbor showered in the morning. The gentleman at the check-in was very nice and did not charge us a pet fee for our inconvenience. It was not the hotels fault so I won't complain about the neighbor who let their barking dog in the room for over and hour in the evening (during my baby's bedtime). Most people took their dogs when they left the room so this is "not usually an issue". The complimentary breakfast was coffee and oatmeal and muffins. There was no room service but you can walk to the Denny's and McDonalds next door, or order pizza delivered to your room... The room did have a tv, ac, ironing board, and I could see my car from the door. Also the bed was comfortable even though the pillows were crappy. We likely will not be back. Thank you for reaching out and writing your review. We are sorry you were not satisfied with the accommodations of your room. We are going over the room conditions of your room with our housekeeping staff and housekeeping supervisor. Also apologize for any other inconvenience that may had occur during your stay. Hopefully in the future we can make it up to you if your willing to give us another chance. The hotel was virtually empty. We'd reserved a suite and were sent to the "annex" on the 2nd floor with no elevator. This was a big challenge for us. I asked for a first floor room and was told this was my only option besides a regular king room which would not work for our party. We were then woken up in the middle of the night by very loud music from 4 rooms away. It took 45 minutes after reporting for it to be stopped. It woke up my toddler as well. I was offered only a half-hearted apology and nothing else for our troubles. The price was good and the room was clean. But the hotel is definitely aging and run down. The lobby area looked nice and updated, so perhaps only the "annex" is run down, but it was pretty bad. The common areas (hallways, etc) over there were pretty dirty too. Dear Guest thank you so much for providing feedback. Your feed back is important to us for staff training .Our suite room is only in annex building on 2nd floor. We apologize for experience you had for loud music from other guest room, our front desk agent has asked to turn down volume. If we receive another complain from you or some other room has complained after that our front desk agents also empowered to check out guest who do not follow our request. For your information we have renovated entire hotel recently. This is an older property that has recently renovated its original building and rooms. More wall outlets would've helped. When I travel the New York Thruway, this is the hotel I usually stay at. It is a good blend of price and features. Thank you for taking the time to write a review! We are so happy to hear that you choose to stay at our location every time you travel the New York Thruway. Sorry that there are not enough wall outlets. Cant wait to have you back in the near future. "Clean, quiet room in convenient location"
What a dump. Dirty, heating hardly working properly and noisy. Disgusting carpeting, filthy dirty. Totally run down. Electricity and wiring seems from 50 years ago. Room not heated upon arrival. Probably 50 degrees. Thank you for writing such a detail review. All your comments are essential to educating to our staff. All your complaints will be addressed. Hope you are willing to give us another chance in the future. Can't complain best bang for your buck. Good for the price. group of student taken there for a school trip and they were really accommodating. staff was diverse. services were great. no problems with anything here. Thank you for taking the time to write a Great review. Glad to hear you got a bang for your buck. Also happy to hear that we can be accommodating to your needs and that there was no problems, Hope to see you again in the near future! 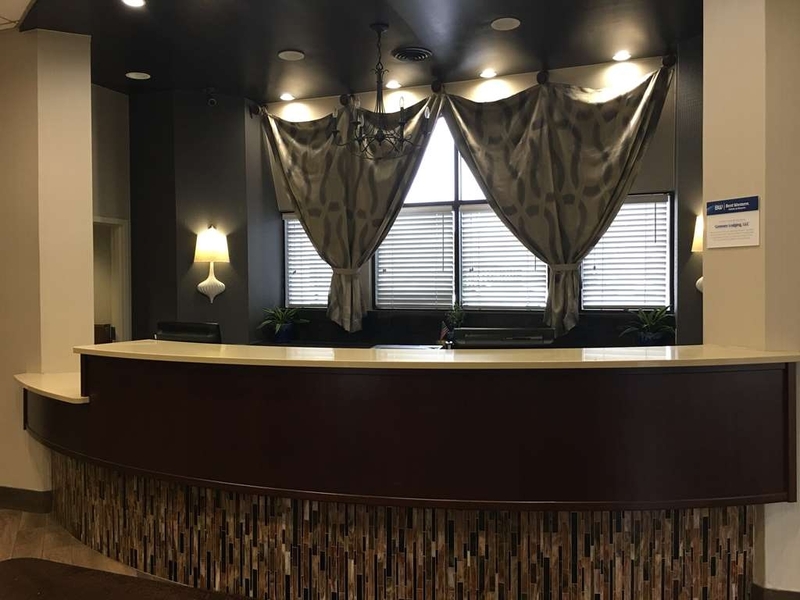 The front desk clerk Tony provides excellent services to all his customers. The breakfast room is very clean and it has many different kind of choices. The fitness room change all brand new fitness machines. Thank you for taking the time to write a review. We are happy that Tony was able to provide excellent services. We enjoy having Tony apart of the team and I know he will be happy his name was mention on TripAdvisor. Glad that you also enjoyed the fitness center. Always a pleasure having you at our hotel. "Road trip stop over Boston to Ontario"
This is an older hotel, clean, comfortable. Faint odour of disinfectant/cleaner in room and hallways. Air conditioner/heating unit in room very noisy. Complimentary breakfast pretty basic. Friendly staff. Two separate buildings - might be an issue for some as reception is only in the main building. If taking a room in the Annexe, ask for the top floor. Dear guest Lyn P Thank you so much rating us and comment for our hotel clean and comfortable. Our break fast items are on rotating menu during week and all items are similar to our competitor brands which charges at least 40 to 50 dollars higher than our rate. We are using industry leading chemicals which leave minimum odor and neutralize in short time. "Enjoyable place to lay your head"
Excellent staff, especially Tony and Chad. Room rates are great. Rooms are clean and beds are comfortable. Breakfast is a bonus, which is included in price, everything was fresh and warm. I would recommend to anyone staying in Utica. Thank you for taking the time to write such a great review and giving us a recommendation. We value our guest feed back, Our staff strives to make all our guest to feel like "home away from home". So glad to hear that you enjoyed our breakfast and the cleanliness of the room and bed was comfortable, I know how important it is to get a good night rest. We look forward to seeing you again! We stayed here for just one night to break up a long drive home. It was convenient, cheap and clean. Rather outdated but looked after. There were several fast food restaurants just in front of the hotel and a Walmart not far away. It had easy access to the highway as well so it was an easy arrival and departure. Tony at the front desk was great checking me in - friendly and welcoming, even at the late hour we arrived at. Thank you! "not so hot in Utica"
Hotel needs updating and modernization. Poor attention to detail for cleaning and maintenance. Worst breakfast encountered at a Best Western. Hotel staff was very good, but accommodations left something to be desired. Aside from the friendly man at check-in and the convenient location, this was REALLY bad. I have never seen so many stray hairs in a bathroom in my life. I cleaned them and found more. They were everywhere--in the middle of the floor as well as the corners, behind the toilet seat, on the walls, the counter.... The bed was a full size, but sat on a queen-size frame. This left frame parts just sticking out from under the bed, but hidden by a bedskirt--making walking into it inevitable. I got the big bruise to remember my weekend by. The breakfast was disappointing and the check-out man never even asked how my stay was. Maybe he saw it in my eyes. Stayed here on way to Rochester ny from vermont. 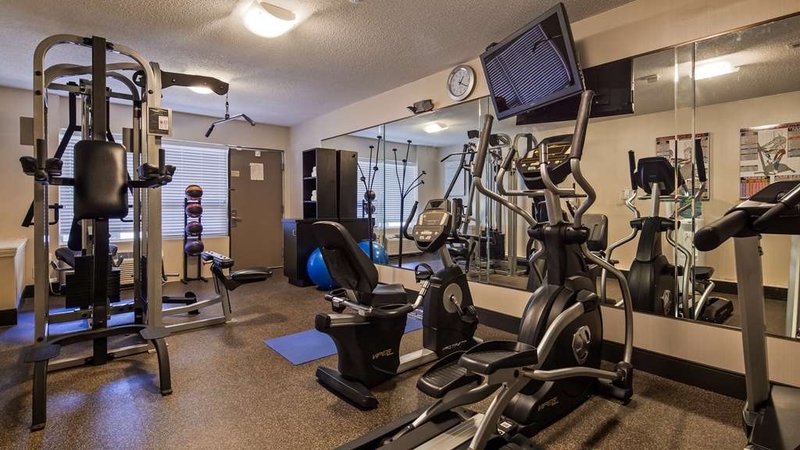 Perfect location, good fitness center and the staff was extremely helpful. Relaxing atmosphere and breakfast was ok too. Clean rooms. Would stay again. "Standard motel building enhanced by great staff"
Clean, quiet, well equipped and a good breakfast. All you want from a motel. The building appears to be a modified standard motel with an additional covered walkway at the rear that improves sound proofing and bad weather access. What lifted it to another level was the friendly and very helpful staff. A good stay. Dining tip - the Delmonico's steakhouse just next door is simply amazing! I was in Utica to do some Fall bicycling on the Erie Canal. I was fortunate to find the BW Gateway Adirondack Inn to be adjacent to the Canal. 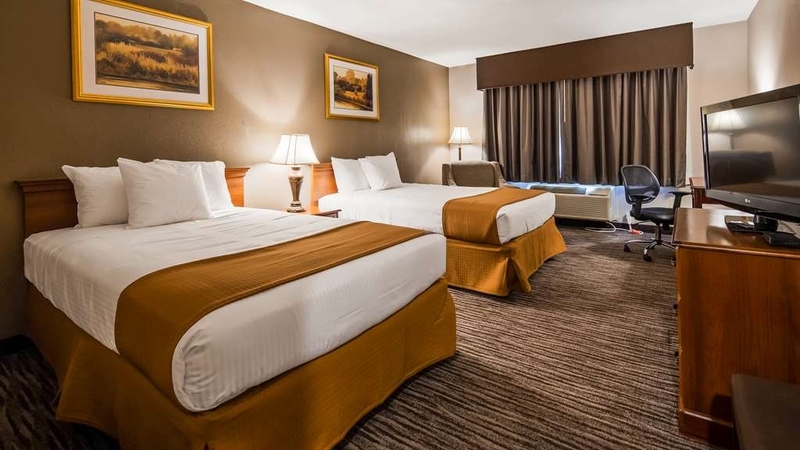 The hotel is clean quiet and comfortable and the staff was courteous and helpful. I stayed two nights mid week and will stay again if I am in the area. nice room well appointed and clean Had a outside cover around walkway for noise and weather. Check in was very easy and parking OK will stay any time i travel that area. Easy on off I 90 at exit 31 about a block off toll road. This is a standard hotel located just off the Thruway. Everything is adequate. Check-in was efficient. Rooms are large, well-laid out and clean. No bed bugs. Our room was in the auxiliary building which meant a longer walk to the breakfast room. Good variety of breakfast foods. Hot hard-cooked eggs with potatoes and sausage patties. Pancakes, bagels, English muffins and donuts. Cereal, oatmeal. Seemed a little pricey @ almost $100. This was a very nice accommodation with several restaurants within walking distance. The continental breakfast in the morning was a plus and the gas station close by made next morning departure easy. All staff were friendly and helpful. I will not be staying at this hotel again in the future. When checking into a hotel, I am always asked for my ID and form of payment. The person behind the counter checking me in usually gives a cursory glance at my ID and then swipes my credit card and reminds me that a hold of a specified amount will be made to my credit card for incidentals. In this case, the counterperson started typing- a lot- once he had my ID. When I asked him what he was doing, he told me that he was updating his system. I told the counterperson that this was not necessary because I was only staying at the hotel for one night. He insisted that he needed the information and continued typing. I had to grab my ID away from him before he managed to capture all of my information from my ID. (I am wary of anyone having too much information about me due to identify theft.) There are two buildings to this hotel. The first building, which is attached to the lobby, reminded me of an old one-level motel that they had decided to enclose in glass. The second building, which had two levels, was located a short walk across the parking lot from the first building. I stayed in the second building on the second level. While the room was a decent size, it not only looked old (popcorn walls and outdated décor), but smelled slightly musty. And here's the main reason why I will not be staying at this hotel again in the future: safety. As a female, I look for hotels that are clean and safe. In this case, my hotel room was clean (although it smelled musty), but I did not feel safe. This is because outside of the second building where I was staying, there was a group of men sitting in the area in front smoking. The first time that I saw them was when I entered the second building with my luggage. I got catcalled and several of them said “Hey baby” to me. I didn't think anything of this because I thought that they were taking a short smoke break. I did not expect them to be there an hour later when I was leaving for dinner. Again, I got catcalled and one of them asked me if I would like to join him in his room. I ignored him, and to my dismay, when I came back from dinner more than an hour later, they were still there. Once I was safely back in my hotel room, I realized that I had forgotten an item in my car, but there was no way that I was going to leave and endure another encounter with them again. I suppose that I could have called the front desk for assistance, but it was late and I was too tired to try to explain the situation. There is no elevator in the second building even though the second building has two floors. The hotel has breakfast, but if you do not like it, there is a McDonalds situated in front of the hotel. Dear guest, asking ID and updating information is part of our check in procedure, most online reservation or travel agent site reservations not providing us complete guest information. whether guest stay one night or multiple nights information required for many reason. I apologize for your experience about people harassing you in front of building. If you have informed us ,our front desk employee could warn and ask them to leave. For future reference please always inform front desk any hotel you stay. Arrived 9/21/16 for 2-night business trip, selected this property for price and location. Tony at check-in was quite friendly and helpful, checked me in very quickly and gave recommendations on local restaurants. Breakfast was certainly adequate, with cereals, pancakes, scrambled eggs, sausage, all fresh. Hotel seems to be converted motel, with exterior enclosed hallways added during a remodeling so that rooms no longer open to the outside. I unfortunately had no time for the gym nor the pool. Hotel was quiet, beds were good, room was clean, location was convenient, staff were helpful. Good value! We drove our motorcycles in for the weekend to take the Adirondack Scenic Railroad trip up to Old Forge. The Hotel was very comfortable. We were allowed to park our bikes under the canopy to keep the dew off. Tony (Front Desk) was a joy to talk with and made us feel very welcome. We ate the breakfast on our first morning and found was lacking in taste and we decided to go to Denny's across the street the next morning. Suggest you add some protein and maybe have English speaking attendants that could help a little more with the pancake machine. We were put in the 2 story building that is a short distance from the lobby. There is no elevator in that building. We were able to handle that okay, but it isn't always easy to do so. The breakfast room is quite lovely. Breakfast was about usual for such a hotel. I would stay there again but ask for accommodations in the one story part of the hotel. I feel breakfast should have consisted of more options of hot food. The eggs option was just boiled eggs which i don't eat unless its hot. The room was excellent. I stayed in the King room. The locatione was perfect. "Did not stay - Pet Friendly, Not People Friendly"
Stopped at this Best Western on a Tuesday evening (8/30/16). Check in process was all right - relatively quick. Walked to room. Hotel clerk had put us in room with about 10 guys out front (construction workers staying at the facility I presume), yacking it up and smoking cigarettes. No reason to put it us in this particular room, as this is a large facility, and he should have been aware of the extraneous partying going on at his hotel (seeing as they were visible out his back window). After walking the gauntlet of corner boys, we walked in room, smelled like a tomcat had sprayed - that's what you get when you stay at a "pet-friendly" hotel. Room extremely drab and in no way was this facility "Newly Renovated" as advertised in HotelCoupons.com booklet. No way is this even an $80 a night motel - much more on the level of Motel 6. Let's just say we walked out and back into the office and asked for a refund. I complained about where he situated us with the rowdy constructions workers. His response, "It's a hotel, you've got to expect people." Got back in car, drove 15 minutes to Rome, NY, stayed at the Hampton Inn - paid a bit more at $115/night, but it was worth it - place seemed extremely clean and luxurious compared to the this run down Best Western. 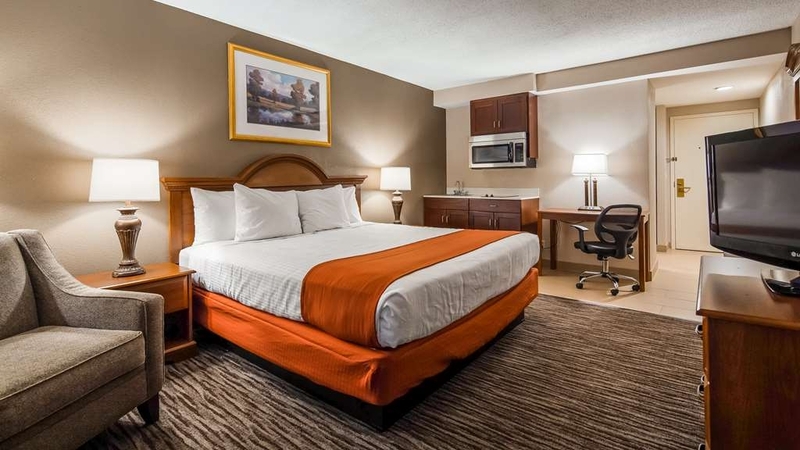 We have always been happy with our stays at Best Western and that is why we booked a room for our trip. When you open the door to the room and you are overwhelmed by a musty smell it is vey disappointing. Had to have the air on and windows open...was just glad that the window did open. We stayed at this Best Western as it was on our route to Vermont, and it was close to "Delmonico's", a restaurant that we like. No complaints about the rate, which was very economical. Bed was very comfortable, and the room was updated and spacious; however, the bathroom was a bit on the small side. The complimentary breakfast was disappointing. Overall, this hotel was satisfactory for our one night stay. very comfortable hotel. good location. Used washer and dryer to do laundry. It was conveniently located. Would of liked to have seen a few chairs to sit in. Had to go outside to sit down while doing laundry. Overall it was a good stay. This is an older hotel and needs some updating but the rooms were clean and that is what I look for. The guy at the front desk was very nice. There is room around the back side of the hotel to park a semi. The rooms were nice and clean and the hotel was quiet which is important for me. I bought 2 different sodas from the machine and both were expired but the front desk clerk gave me my money back. I had to leave early in the morning for work, so I had asked if I could use the on-site gym an hour early and the guy at the front desk said it was OK but the manager was standing there and he said no ($50 didn't change his mind, either).....but rules are rules so I can't really complain about that. This was my second stay at this Best Western..The staff here was very professional, helpful and informative. The rooms are large and the beds are very comfortable. The complimentary breakfast was also a plus and there was a nice selection of food to choose from. I don't understand why hotels are spraying scent all over the rooms and the the lobbies. That smell is both awful and makes me feel that the hotel has not been properly cleaned. If a place is clean, there is no need to spray Febreeze everywhere. Also the hotel is shabby. Drawers and handles falling apart. It was okay but not terribly comfortable. Bed was bouncy and linens where thin and cheap. I was not happy with the odor in the room-it smelled like stale cigarette smoke when though it was a non-smoking room. Also, upon returning from dinner-room had an odor of marijuana.Other than that - no complaints. Great location, great group rate! Convenient to restaurants. Staff allowed use to check-in early. Breakfast was "eh". Bathroom was VERY small, but functional... sink was outside so only needed to be in bathroom for a short period of time. The staff was courteous and friendly. Our room was neat and tidy. Good location, walking distance to a great steakhouse. Was an unexpected trip, was able to get a nice room at a reasonable rate. Unfortunately did not have a chance to utilize the complimentary breakfast. Will definitely stay again. "Great Place after 2 days of running!" this was a really nice hotel and that went out of their way to help my team get a good night's sleep. We had been running for 238 miles and they let us have rooms on the bottom floor so we didn't have to climb stairs! Clean and and in a great location for restaurants too! This hotel is in desperate need of a remodel. We stay in lots of Best Western Hotels and usually find them to be pleasant. The lobby and breakfast room area has been remodeled but not the rooms. I think our room was clean but it was hard to tell because it was so dated. For $100 a night the best I can say is that the bed is comfortable and there are a few fast food restaurants within walking distance. "Nice place to spend a night"
Nice hotel, good breakfast allowed for a good rest. The room was a little damp due to being closed up for quote awhile, but running the air conditioner for a while cleared most of that out. Not a major issue, but something to be aware of. If travelling through Utica check it out. We were travelling from Maine back to Toronto and I would recommend this hotel to friends and family. It was clean and comfortable and the price was right. Friendly and courteous staff and a hot breakfast included, all good. 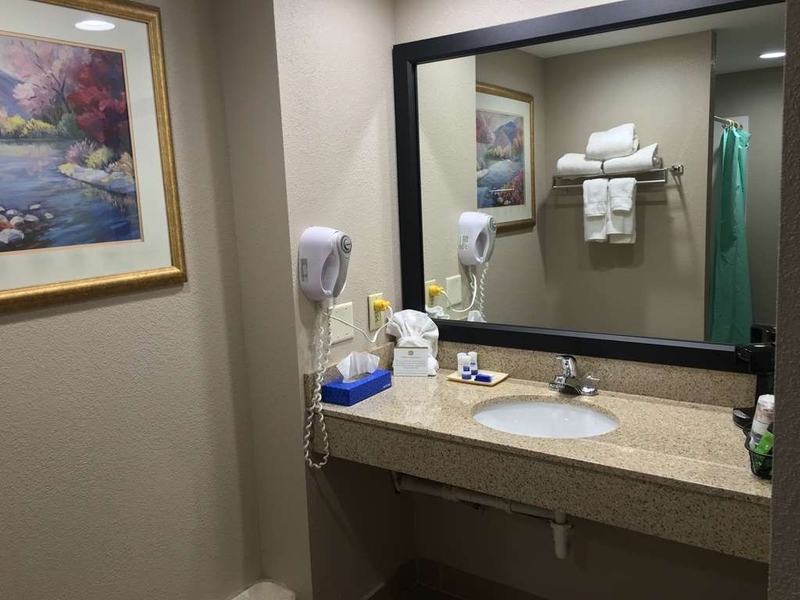 This Best Western is clean, situated very near a good steakhouse, and has a friendly knowledgeable staff. My room, 226 was more than adequate. Large, clean bathroom, although the toilet made strange noises at the water tank refilled. Best part of my stay was the bed. I haven't slept that long in literally years now. Incredibly comfortable for a good sleep! Breakfast was served at 7 am. Lots of hot coffee, omelets, bacon, potatoes, and chocolate chip muffins, not to mention make them yourself pancakes. All in all a nice place to stay...just a bit pricey. In the $170ish range. Front desk person Tony was friendly and very helpful. 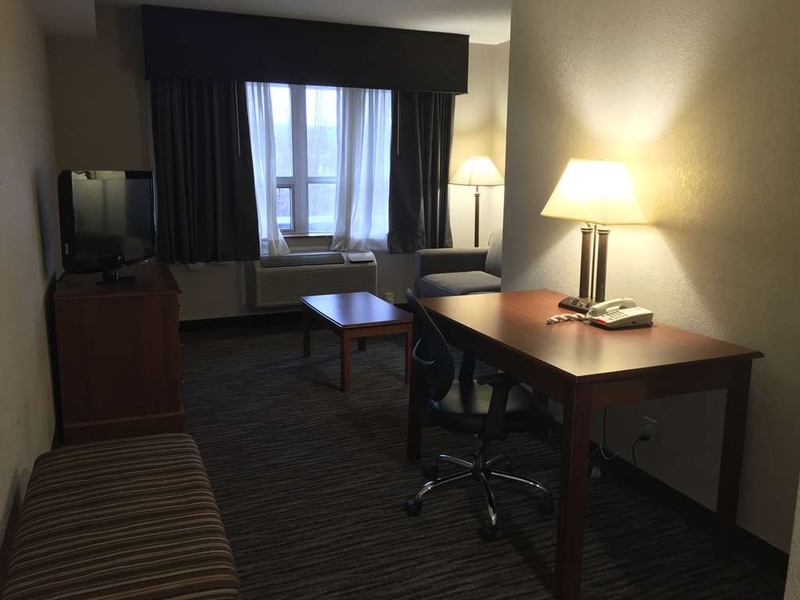 We stayed at the Utica New York Best Western and experienced a Great Value. The staff was courteous and helpful. Very clean. The breakfast was very good for this type of thing. If we are in the area, we will definitely stay there again. "Ok if you just need a place to Sleep"
The Hotel Staff is very nice - but the hotel is old - and not as clean as I would hope. They do have a great breakfast. They claim to be Harley Davidson Rider Friendly - but they really aren't. They claimed to have upgraded my room - but what they gave me was the same as I had booked. So Harley Riders Be Aware - they really offer you nothing extra. For the Room - The toilet ran on and off all night. The beds were clean and comfortable. So if you just need place to sleep - this is OK. This was a nice place to stay. We had a problem with the stopper in the sink and the desk clerk came promptly with a tool to fix it. Good breakfast selection. Also, this property had been renovated and the glass between your room and the parking lot greatly reduced outside noise. We had a nice room that was secluded back from the highway. Well maintained and seemed to be recently remodeled. Close to highway and close to downtown. Several restaurants within a short drive from hotel. We didn't rise early enough for hotel breakfast but others staying at hotel said it was very good with lots of choices. "Clean, Quiet Hotel that Accepts Pets"
When travelling with pets, especially cats, it is difficult to find decent places to stay. This Best Western was a "find". 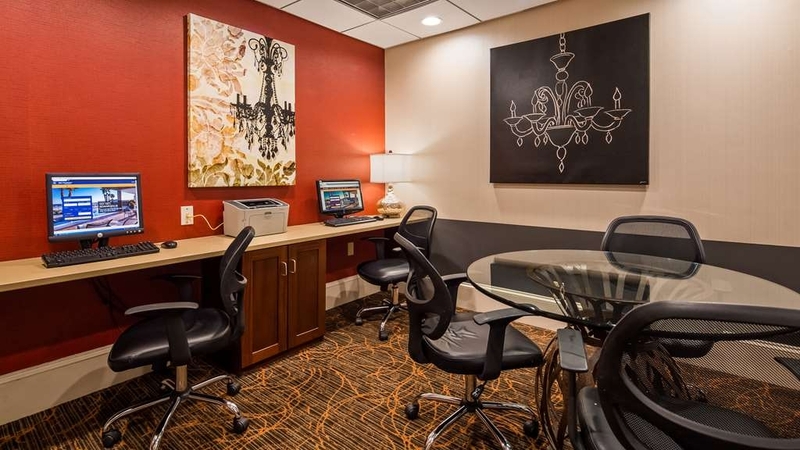 It is not modern - don't look for extra plugs for your cell phone - but it is clean, the AC worked perfectly, it was quiet, the bed was VERY comfy, there was a small fridge in the room, there was free wi-fi, decent breakfast, a friendly front desk and good location. What else can I say? I slept like a log. My cats were happy. And, I didn't pay and arm or a leg for myself or the kitties. I would definitely stay here again. BTW, it is located in very convenient (but not obtrusive) walking distance to two fast food places as well as a local steak house. We stayed at the BW in Utica because of business. We were really only in our room for the evening and night. It was comfortable and clean with a comfortable bed. The decor is a little tired and dated and a refrigerator would have been nice. Overall, we had a good stay. It is easy to get to from the NYS Thruway. Spent some quality time with family at my usual Best Western. The room and bathroom are always clean and smelling fresh. I always feel refreshed after spending a night here. Staff are super!! It is nice not having to run out for breakfast. Food options are plenty and close by. Thank you for taking the time out of your day and writing this wonderful review. We are so glad you came back and that your stay was perfect. 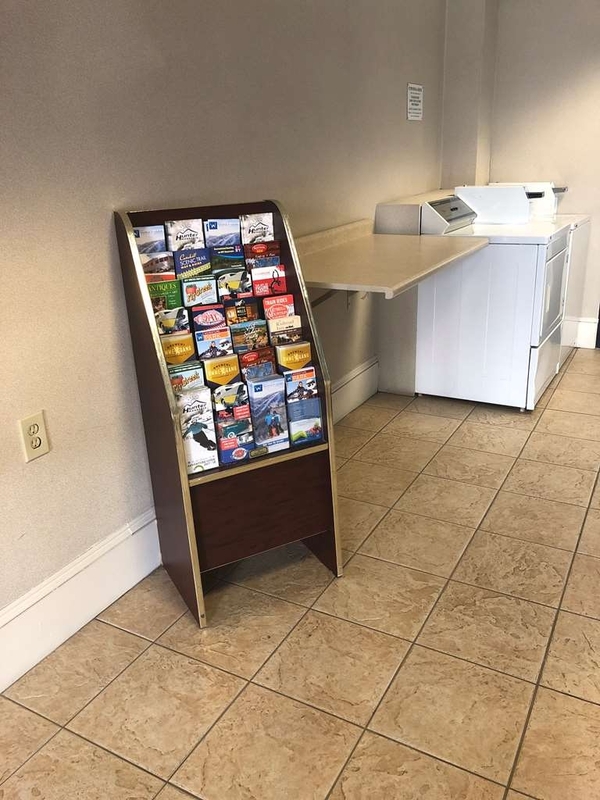 You are always welcome here at the Best Western in Utica, NY. Overall we had a decent one night stay. Check-in was fine, the front desk was friendly. (Checking out was quick as well. The young woman at the desk was courteous. The manager standing behind her looked like he was having a bad day.) We stayed in the annex building. This building was separate from the main motel. You did need a room key to get in. The hallway was dark and there was a slight odor. The room was decent. The bed was ok, but seemed like it will need an update at some point. 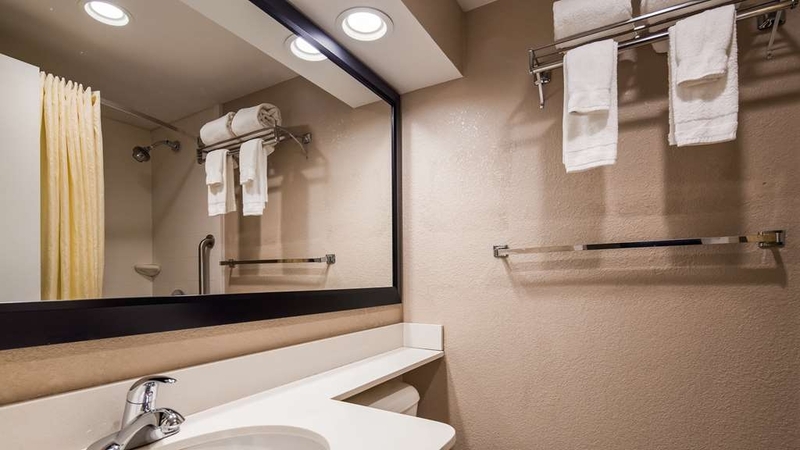 The bathroom was clean and stocked with towels. The room and carpet were clean. Breakfast was good. Something I had never seen before was a pancake maker. It kicked out a small slender pancake that was ok. The rest was the usual eggs, bacon, hot oatmeal, cereal etc. They kept it stocked which was good considering there were a number of people coming in - the place seemed full. Wifi worked ok. AAA lists as a 2 diamond and that seems fairly accurate to me. Thank you for your review! We are glad that your room was clean and comfortable. We hope if you are ever in the area that you will stop and stay with us again. Just give us a call and we will do everything we can to make your stay a great one! I've stayed here before and the front desk staff were friendly and competent. I was checked in quickly and greeted as a return customer. The rooms may be a little outdated but the bed was comfortable and the room was clean. The price is well within line. I will definitely stay at BW again. Thank you for your wonderful review! We do our best to remember our return customers and we are so thrilled when they come back to see us. We look forward to seeing you again. I had only two minor complaints during my stay....the wireless internet was a little "iffy", and the butter at breakfast was so chilled it was impossible to spread with the flimsy cutlery. However, those two items were easily forgotten when getting a great, sound sleep in the comfy bed with comfy pillows (and I'm VERY particular about my pillow). The room was extremely clean. The outside of the hotel was a little dingy, but the room was nicely decorated as were the lobby and breakfast area. The hotel is very close to the highway and numerous restaurants. Front desk staff was friendly and helpful. Thank you for your wonderful review and we are glad that you enjoyed your stay with us. Thank you for mentioning how clean your room was, we take great pride in our cleanliness. We will also consider keeping some butter out so it will be easy to spread. Once again thank you for choosing us and we hope to see you again! "Fresh Paint, old furnishings, VERY disappointed, look elsewhere first." My girlfriend and I stayed there while picking u her son from college, as soon as we walked in the lobby we could smell the stale smoke smell. The front desk associate did not even look up to greet us, she just said hi and seemed busy. She had trouble with both credit cards and after I suggested she try another computer and it worked fine. Room 228 was the room we were given, it was in Annex 2, a separate building to the left. The room had fresh paint and wallpaper but everything else seemed to be outdated. Old lamps, nightstands and dresser(/TV stand). The mattress was worn but looked pretty new. The guests in Room 230 were very loud, in and out of their room. You can't sleep in because the room attendants are loud, doors slamming against the night latch, you can see the door damage from it. The outlets in the room are so worn that they don't hold a charger and are unsafe! They paint and wallpaper but leave the old outlet that takes about 5 minutes to change and costs about $1.25. Breakfast was scrambled eggs, biscuits and gravy, cereal, and the usual breads. Thank you for your review and we apologize for the issues with your credit card upon check in. We are very sorry the room wasn't up to standard and you can be sure all the issues were addressed. We hope that if you are ever in the area you will give us one more try and we will do everything we can to make your stay perfect. "Decent hotel when passing through"
While the lobby area and breakfast area are very modern and sleek, the rooms are a bit dated. Our room had a very stale (don't know how else to describe it) smell - either it had been closed up for awhile or someone once smoked in there and they were trying to cover it with freshener. It was tolerable for one night. Also, the walls are like paper, we could hear the people in the next room talking. Nice job on the breakfast offerings. Once again our stay at his hotel was great....We had an issue with the T.V. so, I called the front desk..Within a matter of minutes Vallerie was at our door...She came at least 4 times trying to figure out what was wrong...They had changed service and there was a problem with the remote....She was so friendly and helpful...Everyone was so nice and the breakfast was great....also, the rooms were very clean and the bed was comfortable..
Clean room with comfortable bed. Excellent breakfast served in the morning. Hotel is minutes off the highway and many restaurants were at walking distance. Staff is helpful and friendly. Will stay again. very clean hotel, staff was helpful, restaurants and stores were within walking distance.....would stay there again next time when I'm in the area. Very east to get into and out of. very convenient and friendly located off the highway. gas stations are very near by to hotel. very nice location just outside UTICA. 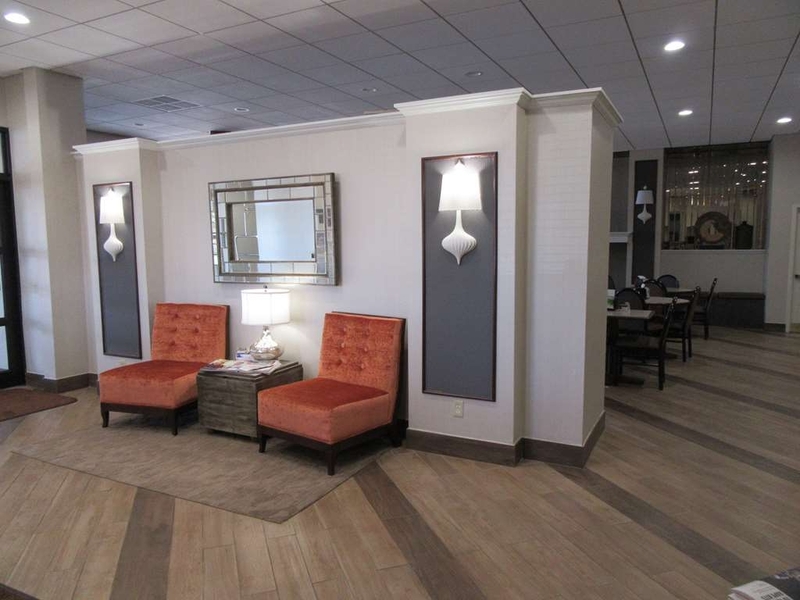 The Best Western in Utica NY has undergone a much needed and delightful face lifting since the new group took over. The new mini gym, compact but extremely efficient, is miles over the old one. The breakfast is quite adequate and there is variety and menu change every day. The façade has changed, after years of benign neglect, to a well lit and modern lobby and a update on the room décor. If we had any complaint, it is the curb from the highway that leads to the hotel. Don't know who, including the city of Utica, should be responsible, but it has been rocky and bumpy for years, and the problem is, vehicles entering from the main road, because of traffic, must speed to avoid being hit from behind or broadsided, risking sending the vehicle to an alignment center. Wish this issue could be addressed and fixed. It was a very nice stay. Quiet and peaceful. Bed was on the hard side but very comfortable. Free internet was great. TV was missing a bunch of channels because of the digital switch. Location was great and close to town. "Great Place & Great Value "
This is our second trip at this hotel. The staff is friendly and more then willing to help you. Tony the desk clerk was down to earth and helpful. Our room was clean and safe. We come here to see my brother in law and his wife and their twins our nieces. Utica is a great small city that has a lot to offer. Plenty of shops and plenty of restaurants to eat at. We travel a lot and stay at a lot of hotels. This property is a great gem. The rooms are up to date and spacious. We love the shower. Water pressure and temperature was perfect. We would recommend this hotel to anyone. We look forward to many more trips here. Thanks Tony and staff for making our stay so great. We truly appreciate you guys. Thank you for your wonderful review! We are glad that your stay was everything that you expected. We hope to see you whenever you are in the Utica area, you are always welcome here with us! Good for 1-night stays. The hotel just on the average, good enough for sleep. The free breakfast included does not have a huge variety but the quality is good enough Cons. The hotel seems old. Pros. Very clean. Thank you for your review and we appreciate your feedback. We are glad that your room was clean and that you slept well. Our breakfast menu changes from day to day but we are always open to suggestions. We hope to see you again whenever you are in the Utica area. This is a converted motel to a hotel. We only stay at Best Western. Couldn't get the BW website to make reservation for us. We were desperate and had travelled 4 hours longer than we wanted. The gentlemen who checked us in was nice and helpful. Bc it was late, he gave us a discounted rate. He was able to give us sheets and pillows for our blow up bed. Breakfast was the standard and acceptable. While the rest of the family went to eat, my teenage daughter was still sleeping but woke up with ants in her bed. We had had no food in the room. When I went to dry my hair the hair dryer wouldn't work. I went down to check out, I told the gentleman and all he did was write it down and check me out. No apologies or anything. We likely would not stay here again. Thank you for review and we appreciate your feedback. We are glad that you received a good rate and we were able to help you with your air mattress. We are very sorry about the ants and be assured we have addressed the problem immediately. We hope that if you are ever in the area that you would give us one more try so that we could make your stay wonderful. This is a location that always provides excellent quality and price for both rooms and amenities. We highly recommend this location. It is in the perfect location in relation to the New York Thuway. Just minutes from the off ramp for Utica. The Hotel has a varied display of entertainment and attractions in the area as well as directions to local eateries. Thank you for your excellent review! We hope to see you anytime you are in the Utica area. Who would expect a Best Western Inn in Utica, NY to be wonderful? This hotel was a hidden gem. Clean, modern, great internet, and the made to order pancakes were wonderful! Staff was attentive and caring. I would stay here again. Thank you so much for thinking of us as a hidden gem! We are so glad that you had a pleasant stay and we hope to see you whenever you are in the area. My room was very spacious, they have a lovely, renovated lobby when you enter as well as seemingly renovated bathrooms in the hotel rooms. The staff upon check-in was very pleasant. It has all the standard amenities and I found my room to be rather clean. Overall, would recommend. I was recently in Utica, my long-lost hometown, to hang out with my buddy from 4 years in Spanish class with Senorita Dybas. I needed a clean place to stay for the night. The price was right, the room was adequate, nothing terribly special. But what I didn't expect at a budget hotel like this was an above average workout room, with new equipment and a great TV. If you are like me, things like this actually make a big difference. So, great value, great gym, clean place with no surprises. "My Best Western Gateway Stay Alone"
Thank you for wonderful review! We are glad that you had a great experience with us and hope to see you again in the future, you are always welcome with us! A most excellent place to break a trip into parts and stay overnight. 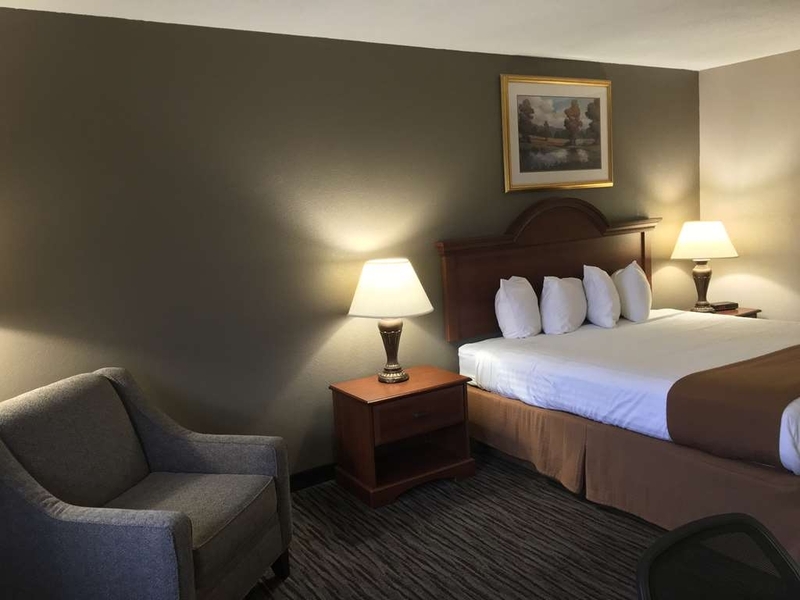 The motel is located less than five minutes from the thruway exit 31. 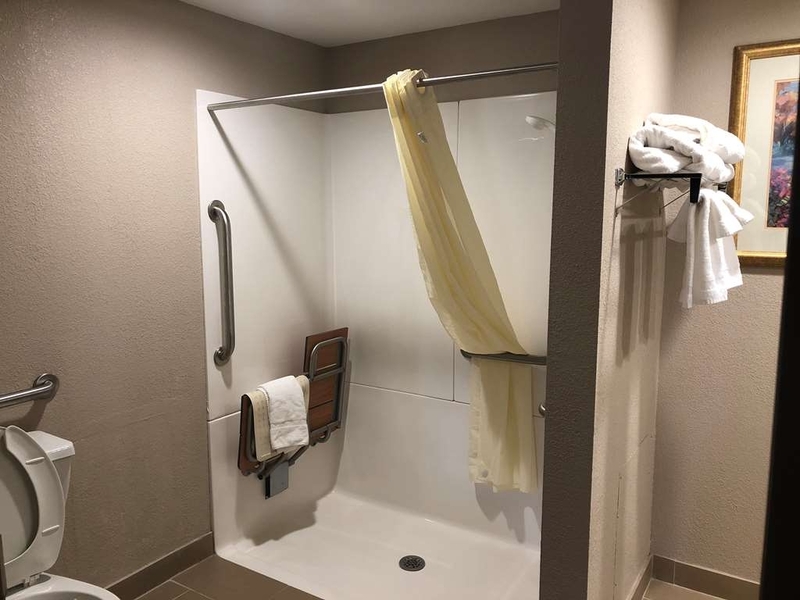 Although we enjoy the facilities and breakfast at this motel, there are lots of restaurant options in the immediate area. Thank you so much for your wonderful review! We are glad that you enjoyed all that our hotel has to offer and hope to see you again soon! "Clean hotel for the price"
The staff was friendly, the room was big enough and was clean. The bed was not very comfortable..... not big enough for 2 people and felt like the middle was softer than the outside. Breakfast was a good variety of food, except no ice for the juice. Thank you for your great review! We apologize that our juice machine was not cooling properly but we have ordered a brand new one. We hope that whenever you are in the area that you will stay with us again. I usually stay at a different chain of hotels when traveling for work. 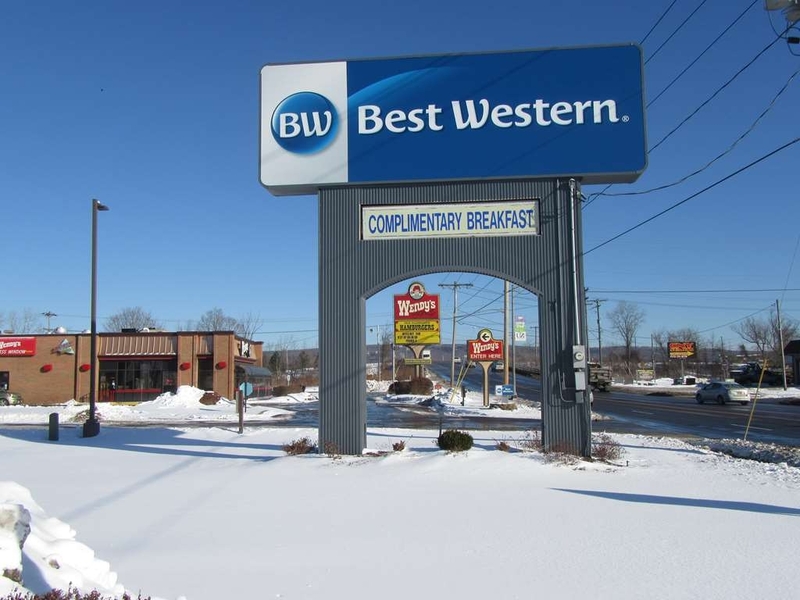 When working in Utica I found my usual hotel chain much too expensive and decided to give Best Westen a try. I haven't stayed at one of their hotels for years. I was pleasantly surprised. I tried it mainly because of a coupon I got at a rest stop. The check in was easy. The night attendant even found my old rewards number. The room was spacious and the bed comfortable. The breakfast was certainly nothing special but a cup of tea, bagel and yogurt did hit the spot. The staff was friendly, parking was easy and it is close to where I needed to be. When in the area I would stay here again. Thank you so much for choosing to give us a try! We are glad that you had a great stay and we hope to see you again soon! We will always make sure that you get the best rate possible and a clean and comfortable room. "My Best Western Winterr Stay"
My sstay at the Best Western Hotel was Great! The staff were pleasant and professional as usual. Most of the all the room and facility was clean and quiet. The side walks and road were clean as well. Overall a great visit. Excellent motel accommodations. Outside Glass outdoor coverage from room to restaurant lobby. Makes walking to breakfast on a cold winter morning a pleasant experience. Friendly service. comfortable bed. Smiling faces. Close to the highway with no highway noise inside the room. Did not have a chance to check out the exercise facilities however absolutely nothing wrong or incorrect. Will stay there again next time for sure. In the Utica area to visit our daughter in college, Best Western Gateway Adirondack provided a comfortable, relaxing overnight experience. The evening front desk clerk was very friendly, and our room was very quiet. This property has a new, very nice fitness room; and breakfast was very good. I enjoy jogging, and this hotel is located right next to a canal with a running path alongside. It is conveniently located just off I-90. "Utica is a great place to visit"
Utica, just off the New York Thruway or Amtrack Train station is a hidden gem. There is always something fun to do. They have a Zoo and the Local Brewery - Saranac gives a great tour. In the winter there are lovely light displays. Lots of great local restaurants too. 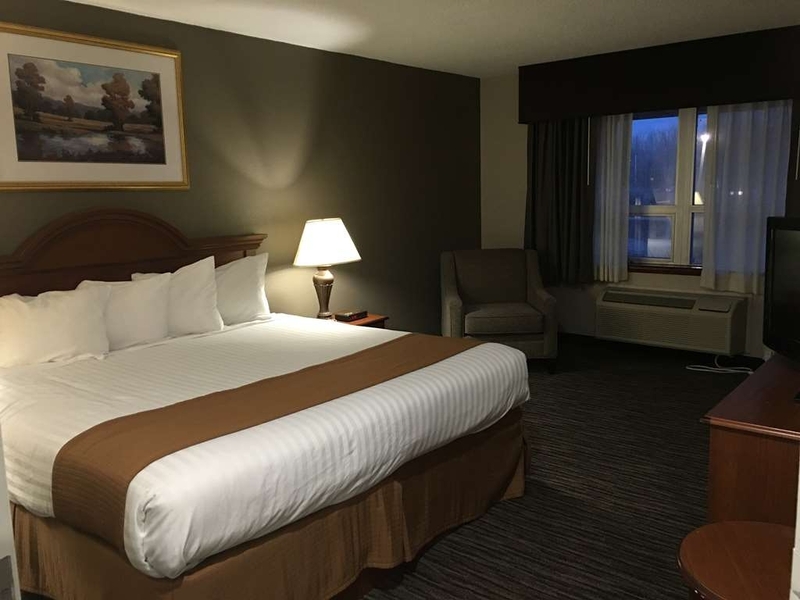 The Best Western Adirondack Gateway Hotel is in a great location. The common breakfast room is large and the selection is very good. The rooms are comfortable and spacious [We stayed in a suite room with a full size frig, microwave, small but useful stove top and comfy chairs. Nice, clean hotel convenient to I-90. Nothing fancy but good value for the money. We arrived very late and had left the dome light on in our car when parking for the night. I appreciated that the manager called us to let us know so that we did not wake up to a dead battery. Nice breakfast which is included. Will stay here again. "Love the fridge, hate the fan!" My husband and I travel all over throughout the Midwest and East, mostly on business. We are big price-point shoppers, always looking for a reasonable rate, but we also have fairly high standards of cleanliness, staff, and such. 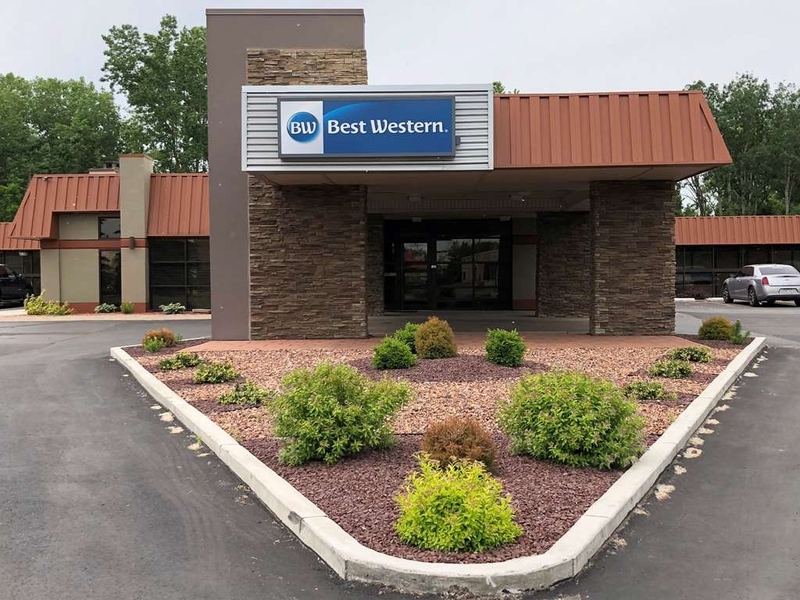 This Best Western property gets about a 50/50 rating from us, with the pluses and minuses sort of canceling each other out. The room was clean and spacious, with not just a mini fridge, but a fridge with a real freezer section! We travel with a cooler, so having a freezer that actually refroze our ice packs was a huge perk! The desk clerk was very friendly and helpful. That's the good news. On the down side, the breakfast was BLAH, with inedible eggs and hugely over-cooked oatmeal. Then there was the heat/ac unit...the fan would not shut off. Mind you, the HEAT would cycle on and off, but the fan was on continuously, most of the the time blowing cold air into the room. The outside temp was below freezing, so this was not a comfortable situation. Overall we give this hotel an average rating, since the ups and downs pretty much balanced each other out. I have stayed at this hotel a number of times, It is not my first choice, but is clean and in the past always helpful. Had a few problems on this trip. My check-in was difficult. The clerk tried to get me to change my room for a lesser one. One TV remote did not work. My room keys both quite working on the second day of my stay. I selected this hotel because at the time I had trouble getting what I wanted in room preference. Hotel was clean, beds were comfy and very quiet at night for sleeping. Very close to I-90. Just a short between Albany and Syracuse, easy access for large vehicle. Plenty of restaurants down the street to choose from. Adequate complimentary hot breakfast. Very enjoyable stay. This hotel served as a rest stop on a journey, clean room, comfortable bed, good attempt at renovations. Breakfast not that great - sugary cereal, phony eggs, soft fruit. Check out attendant somewhat indifferent.. The management team has changed after many years. We have stayed a # of times and were very happy with the staff. 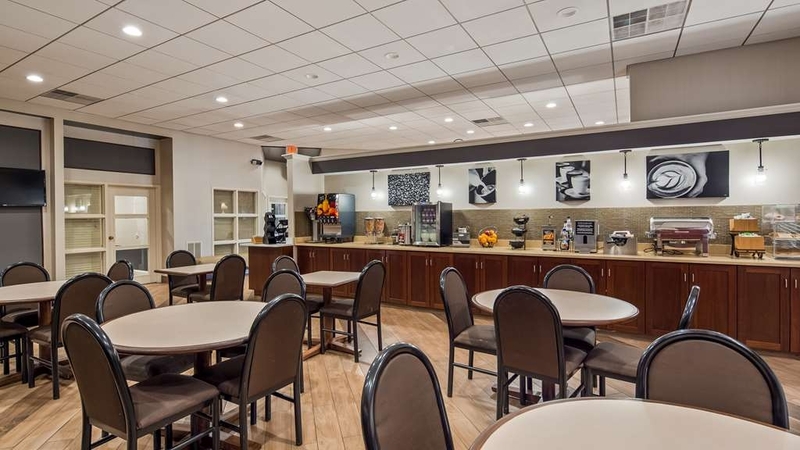 The new team, under Chat Patel, has made many renovations in the landscape, room décor, building and amenities, including the fitness center, small but quite efficient, and the breakfast offerings. Convenient location and competitive pricing. Rooms are clean and furniture is being upgraded. . We are happy and will return. Wish they would fix the curb coming in from the road and shared with Wendy's. It needs to be fixed. My wife and I stayed here five nights while visiting family. We found it very comfortable and very quiet. The girl who took care of our room always had a smile and a cheery hello. The rooms have been recently updated. We stayed here in September of 1964 on our wedding night before driving to Cape Cod the next morning. It was a nostalgic experience to stay here again 51 years later. The service was good, the bed was comfy and the room was clean. Everywhere else was sold out and I needed a place to lay my head so I got a room here. There is a business center and a hot and cold breakfast in the morning. Although I couldn't enjoy the breakfast they do have it to offer. I cant compare the price to any place around there as I was just driving through and no other place had accommodations. But it was $100 a night for two doubles. This Best Western was obviously a lesser brand (Motel 6, Super 8, Days Inn, or such) previously and rebranded as a Best Western. 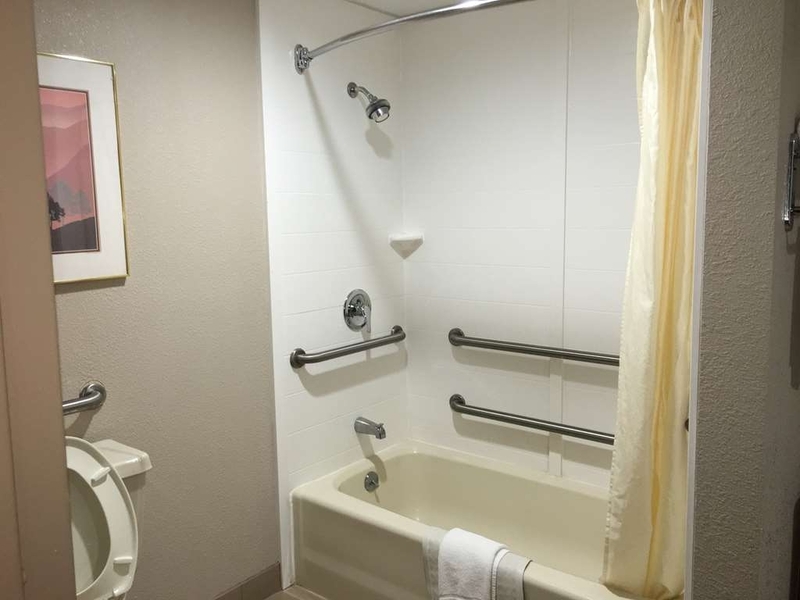 The rooms are a little on the small size and the toilet/tub area is ridiculously small. The sink area is out in the room.We noticed a couple of small bugs during our 1 night there (but I am willing to attribute that to rainy weather and HVAC construction going on at the time. The beds are firm and confortable, the pillows adequate, but there are designs on the headboards that stick out rather far making it impossible for anyone of any height (I am 6' 4" and my wife 5' 8") to sit up in bed and read, watch tv, etc. The staff seemed fine and pleasant. The breakfast area seemed decent, but it so happened that when I went down there it was completely overflowing with people so I can't comment on breakfast. Just bad timing. (Thankfully there is a McDonalds in the parking lot and a Denny's across the street if you're interested). All in all it is ok if you don't plan on spending a lot of time in the room. As I have stayed many Best Westerns in past. This Utica Best Western is served same level of service I have received at other Best Westerns in past. Very courteous staff, convenient location, clean very good breakfast. Just stayed for weekend trip to Utica. Check in and check out was fast,easy parking . The room was very clean good size. Free wifi and breakfast was great. I will recommend this hotel to stay for reasonable price and I will definitely stay again. All fine. The only issue is you may wait at the front desk or for the phone to be answered. After waiting at the front desk to extend our stay after breakfast, I gave up and booked on-line. The place is recently renovated and the cleaning staff work hard and the place is spotless. The in-room wi-fi is excellent. Thank you for your wonderful review and we appreciate your feedback! We are so glad that you had a great stay with us. We apologize that the front desk was a little busy, our hotel has become a very popular place. We hope that if you are ever in the are you will stop and stay with us again. You are always welcome here, as always safe travels. Everything seemed absolutely fine with this hotel, until the next morning (5th/6th Oct). I had 7 itchy bites in a line up my arm, and one on my torso. Since diagnosed as bed bugs. I was very surprised; I thought they were a third world problem. I've travelled to 62 different countries in the past 20 years, and not had this experience before. We were situated in the building adjacent to the main building. Thank you for your review and we appreciate your feedback. We have done some investigating based on the information that you provided and checked the room you stayed in and haven't found any case of bed bugs. The room was rented almost every day in the last 45 days and there have not been any other cases reported. We have a preventative maintenance program in place and all rooms are checked on a monthly basis. If you wish to discuss this issue any further please feel free to give me a call at (315) 732-4121, and as always safe travels. The motel was neat and clean and the staff was very friendly and efficient. At one point we had difficulty entering our room because the magnetic key cards failed to open the door to the building and the room. The manager reprogrammed the cards and then personally accompanied us to ensure that the new card keys worked properly on both doors. He was also vey helpful with suggestions regarding places to dine. Thank you for your wonderful review and we appreciate your feedback! We are glad that you enjoyed your stay even with a few minor issues. We hope that if you are ever in the area you will stop and stay with us. Didn't have a reservation but couldn't drive anymore due to sleepiness. Night manager was really friendly and went out of his way to be helpful. He recommended a couple of restaurants they were very close so we could walk. Thank you for your excellent review. We are so glad that your stay was a pleasant one! I am sure tony will be happy to hear he helped to make your stay enjoyable. You are always welcome here and as always safe travels! "Easy access on and off route 90"
Didn't have reservations, but they were able to accomorate us. Front desk gentleman was very knowledgeable about the area. Gave us several great options for dinner. Hotel is old but clean. Wasn't much we wanted to have at the complimentary breakfast. Tea and toast is fine with us. Thank you for your review and we are glad you had a pleasant stay with us. I am sure Tony will be happy to hear that he made your stay great! We hope to see you again, and as always safe travels. The main building looked very nice. The annex we stayed in looked dated and had a funny smell when you entered the building. The main door to this building was bent outwards as if someone was trying to get in. The room doors looked dirty and had numerous shoe marks on them. These shoe marks could have been made by guests pushing the doors with their feet, but the staff should ensure all doors are clean and in good repair. "Good bargain - nice place"
This hotel is a friendly, older hotel with nice accommodations at a good price. Included in the price is generous breakfast in a large dining area. The hotel is next door to a great place for dinner called Delmonico's. We always look forward to staying here when driving to the east coast from Ohio. "Newly Renovated and Conveniently Located"
Spent one night here on our way to Vermont. The hotel was clean and recently renovated. It is conveniently located near I-90 and is near the Adirondack Mountains. The complimentary breakfast had a good selection and the hotel provided free wi-fi and an exercise room. Parking was available near the rooms and there was an enclosed hallway outside which would be nice during inclement weather. 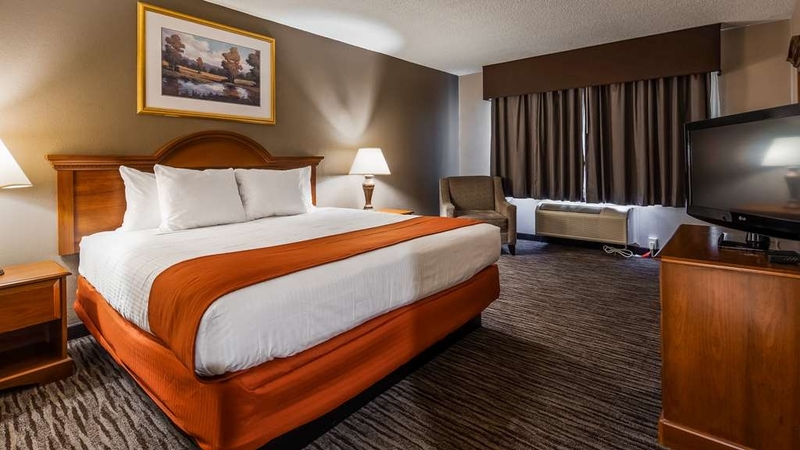 Hotel conveniently located along I-90 with restaurants nearby. Rooms spacious, very clean, and comfortable. Breakfast was fine. Check in and check out efficient and quick. Great price! Lots of parking available during our trip. Room 1- no blower fan on heat/ac. Room 2- no heat. 9:30 fire alarm went due to some one smoking in their room. For all of our trouble got $10 off room rate. WOW I guess it was better than nothing but not real good for all of our trouble. "Nice place, very close to the freeway." Good place to rest & lots of places to eat or get what you need while on the road. Free way is 1/4 mile away so easy access. Utica as a city has it's nice areas & very bad areas so heads up! My only complaint would be the door slam shut when people area leaving their rooms & if they're right next too you? You'll know it! Excellent service at the reception desk, adequate breakfast but the room was small a busy and a clean tidy bedroom. Good location for our one night stop over. we were constantly travelling so it was nice to be able to wash and dry clothes. "Excellent location, clean and great accomadations"
Our group of twelve golfers generally stay at the Best Western chain, as we find the staff very helpful, the breakfast very good, and the location to our golf courses is always central. The rooms were clean and very quiet from outside noises. We loved the fact there were several restaurants within steps of the hotel, where we could easily walk for dinner. Delmonico Steak house was one of those restaurants, we highly recommend it. We also recommend this Best Western as a great place to stay.